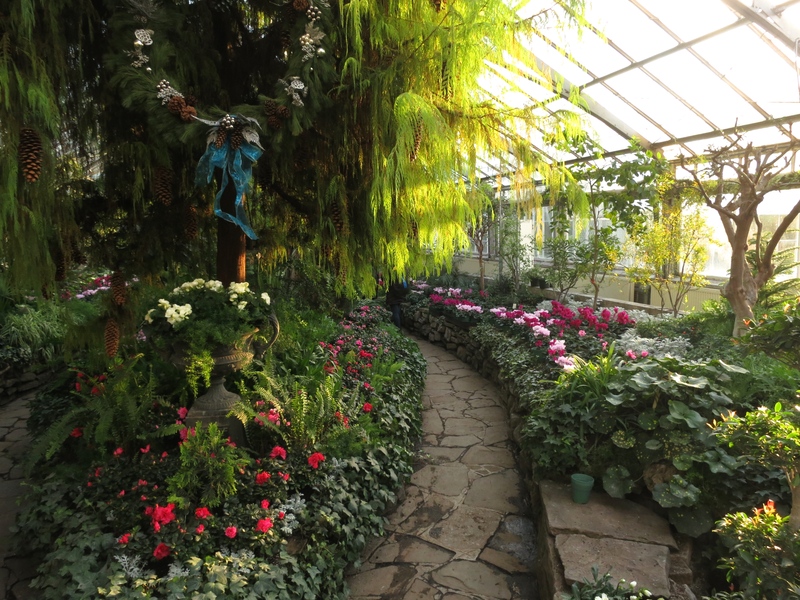 Beyond the gardens path… – Shining the light on horticultural gems around the world. 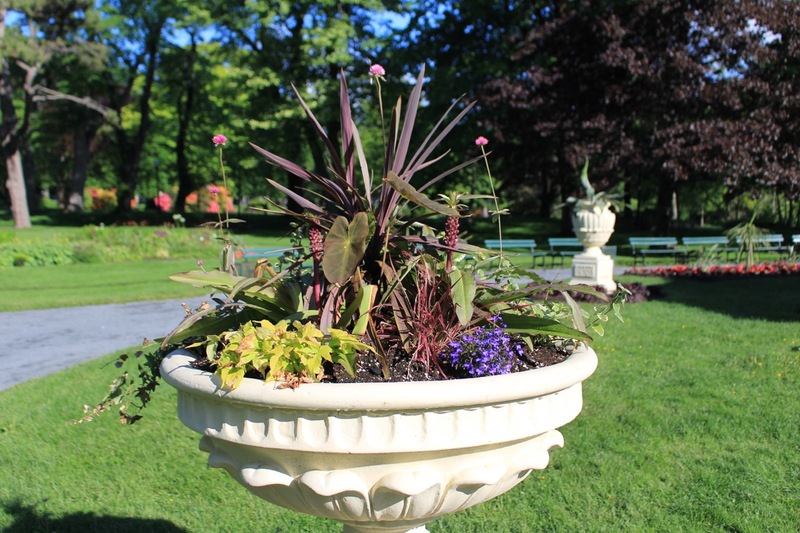 Author SerenaPosted on July 6, 2015 Categories beyondthegardens, Container gardening, Flowers, Halifax Public Gardens, photo tourTags beyondthegardenspath, containers, Impatiens, ornamental cabbage, urnsLeave a comment on Containing oneself. 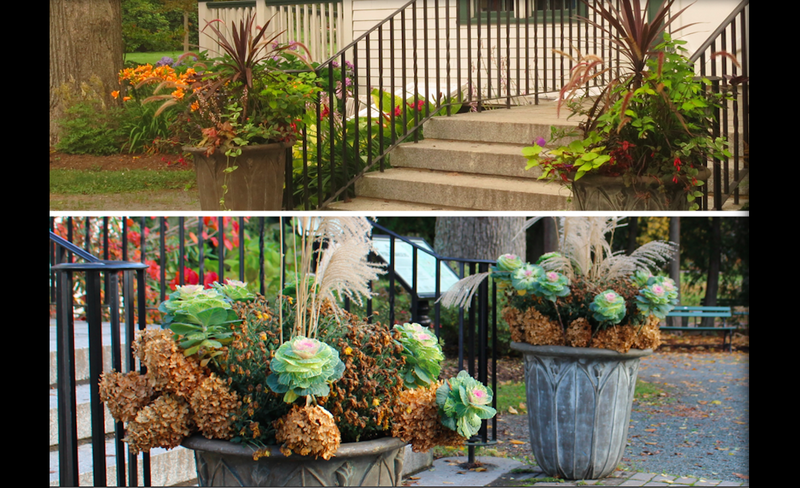 Here is a collection of gardens that speak of home to me. Literally and figuratively. These are places that move me, and places that bring me equal measure of wonder and respite. Two are located in my present home, and the others are found near my home away from home, a former home and my first home. 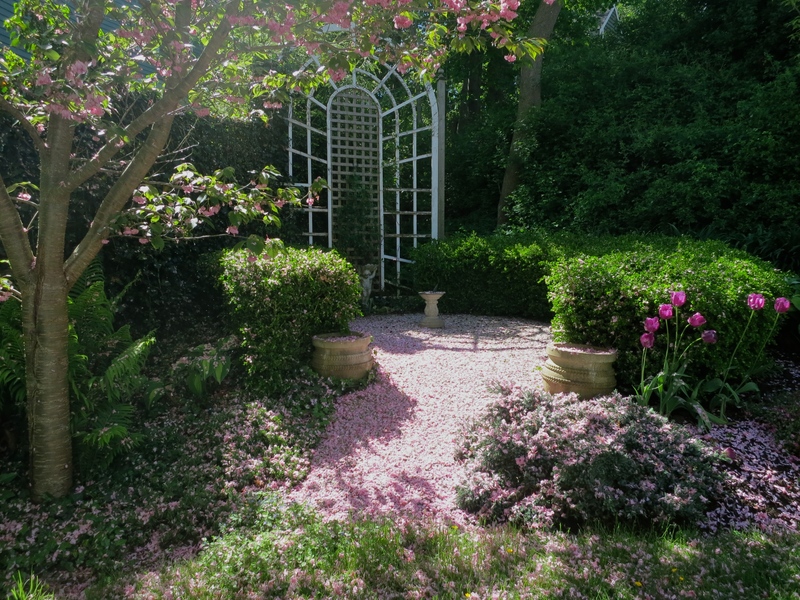 Some of these enchanting gardens I am very familiar with while others though not intimate, I know enough to love. All are worth a visit. My literal home. A garden 17 years in the making. My biggest challenge now is renewing plants. 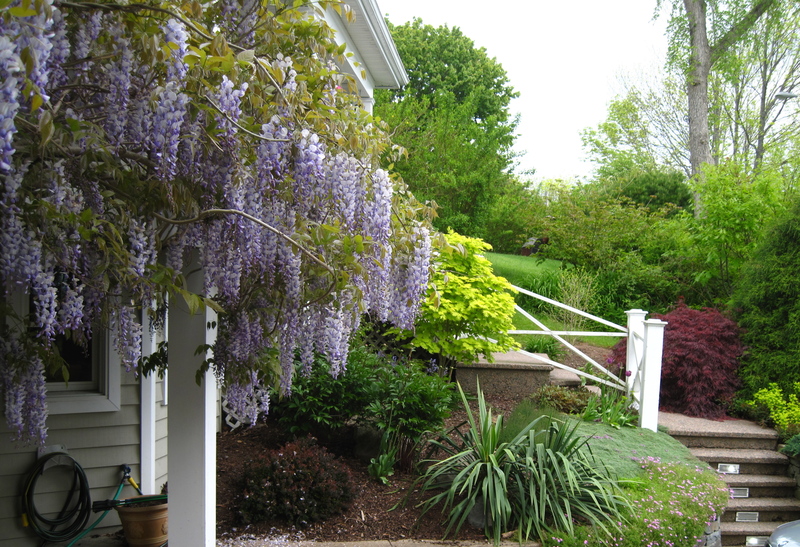 This year I tackled my 19 year old Wisteria. Alas no blooms next year. An Iris hedge which I started from a piece given by a friend. The flowers from the original decorated my wedding cake 33 years ago. 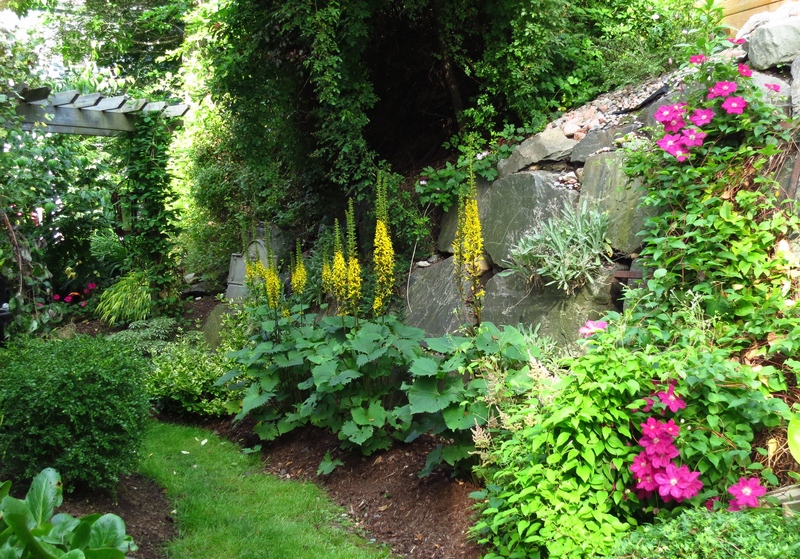 I’ve spent over a decade hiding a retaining wall by creating an early ‘living wall’. This garden that was true love at first sight. 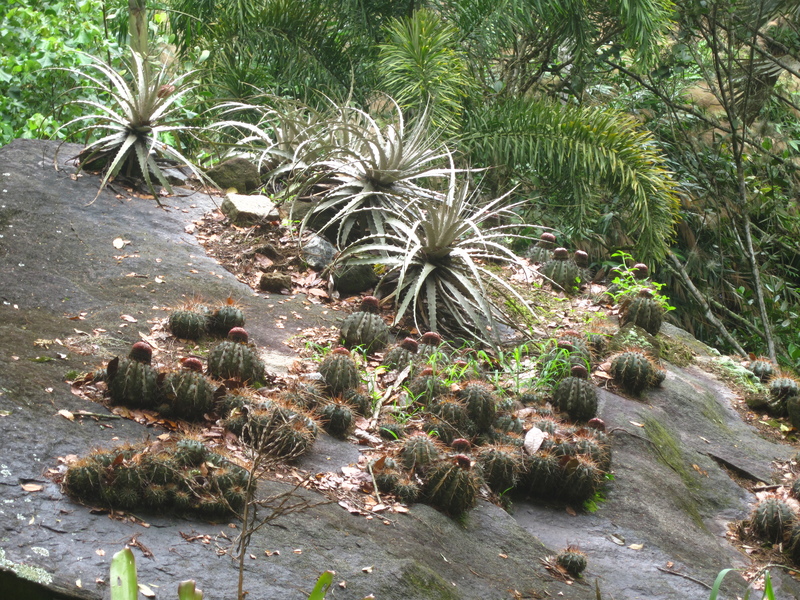 Burle Marxs garden is found near my first home, in Rio de Janeiro, Brazil. The ‘sítio’ contains an incredible tapestry of plants and artwork, encompassing all styles and mediums but almost all, native to the region. A man who considered himself an artist first and botanist second, Mr. Marx painted with foliage plants. From a sunny and humid climate to a cool and damp one, Regents park London. My home away from home for decades. London was often my route during my days as a flight attendant and I visited some part of Regents park whenever I was there. A wealth of bulbs is an understatement. The British do gardening at an Uber level. 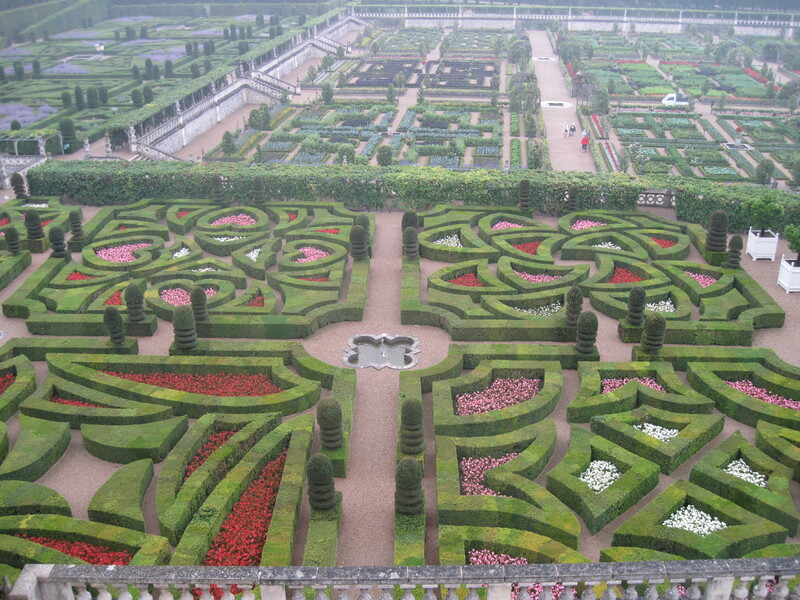 There are Mediterranean gardens, rose gardens containing 12000 roses, water gardens and secret gardens. 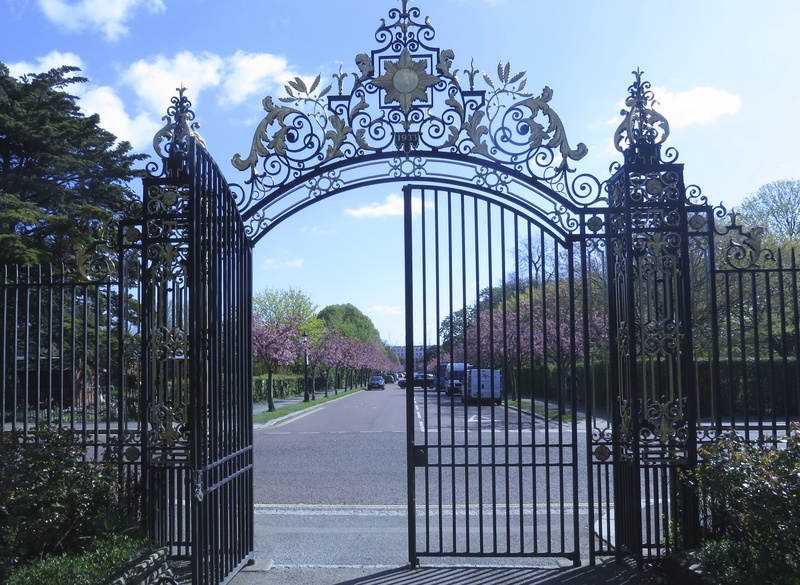 From Victorian to contemporary, Regents park in North West London is 395 acres huge. 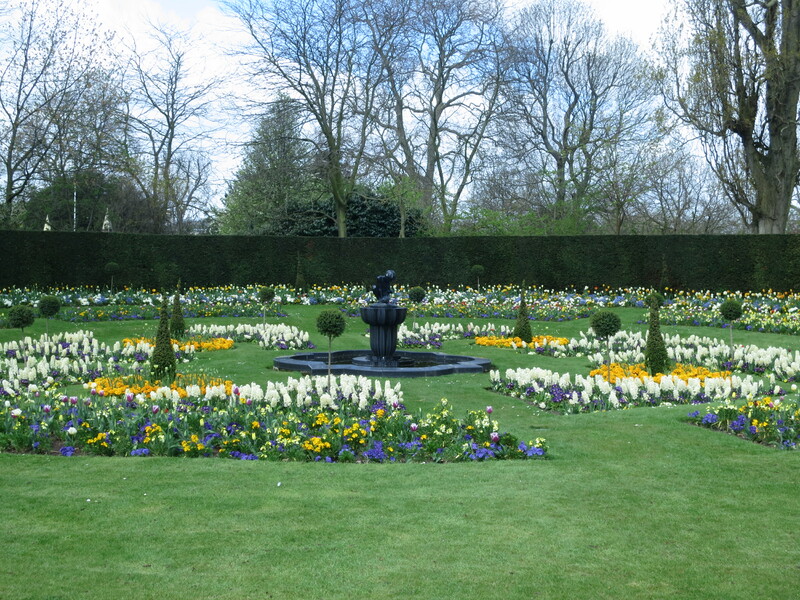 This is but of small section of one of the many gardens scattered around Regents park. 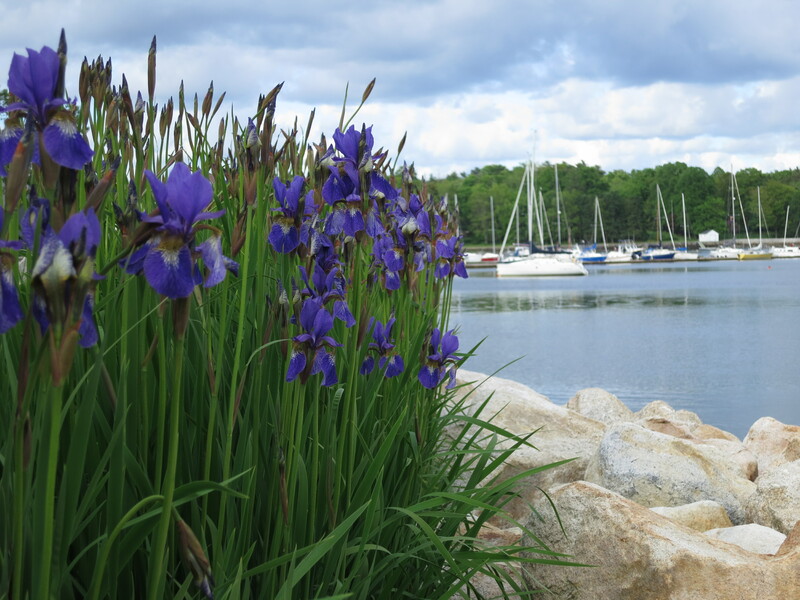 Some are hidden treasures that reward the visitor with delightful discoveries and intimate spaces so keep looking. My first home in Canada, Toronto. 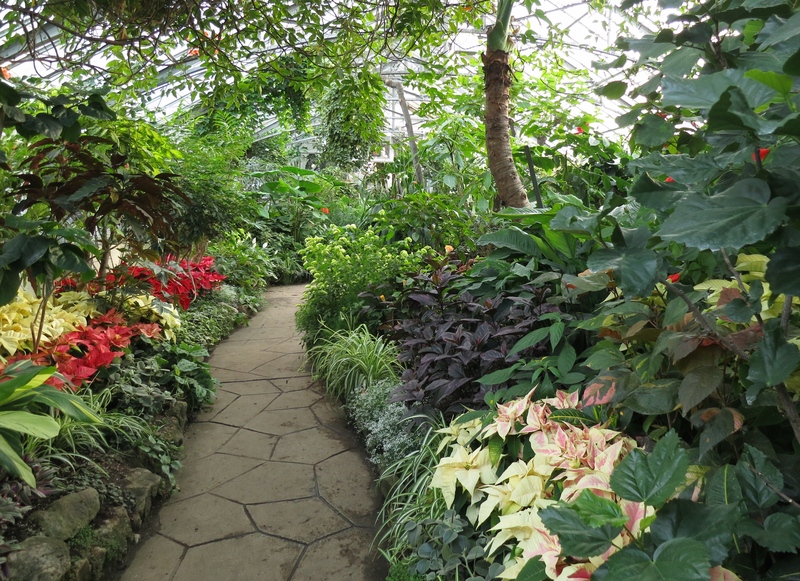 I discovered Allan Gardens Conservatory in the heart of downtown Toronto, with my mother. Ever since we visit annually before the holidays, just when their Christmas flower show is about to start. I LOVE being inside a conservatory or greenhouse when the weather outside is frightful. You can stroll inside where it is warm and bright and filled with colour. I’d give it a minimum ½ hour. The late afternoon sun is equally beautiful inside as out, though it is far more comfortable to linger in its rays inside. There is a succulent house, an orchideum (? ), turtles and bananas and super enriched oxygen. Benches are scattered around occupied by people sitting with a book and enjoying their surroundings. This part of the world was ‘home’ to me for a short time, a mere six weeks, but it deepened my love of gardening and nature, maturing it into a lifestyle rather than a hobby. Château de Villandry in the Loire valley of France. 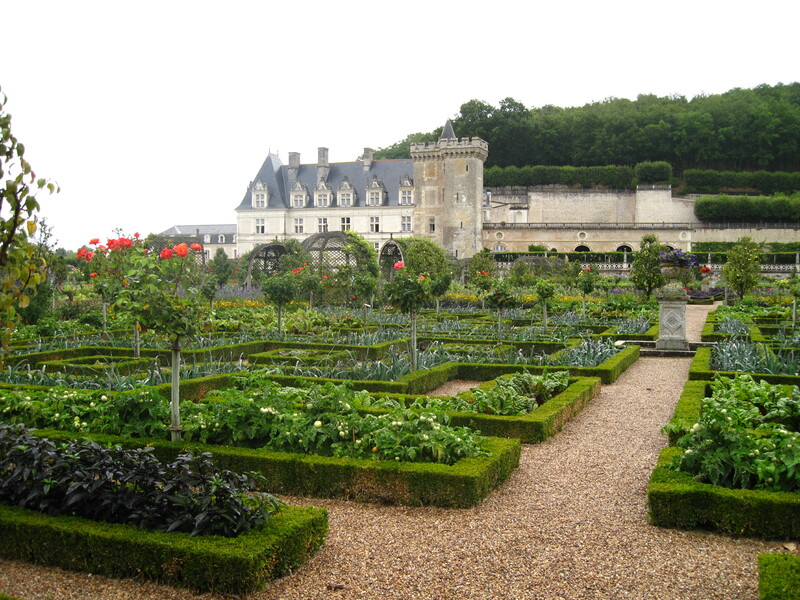 Villandry where food is grown in parterres in a sunken garden. 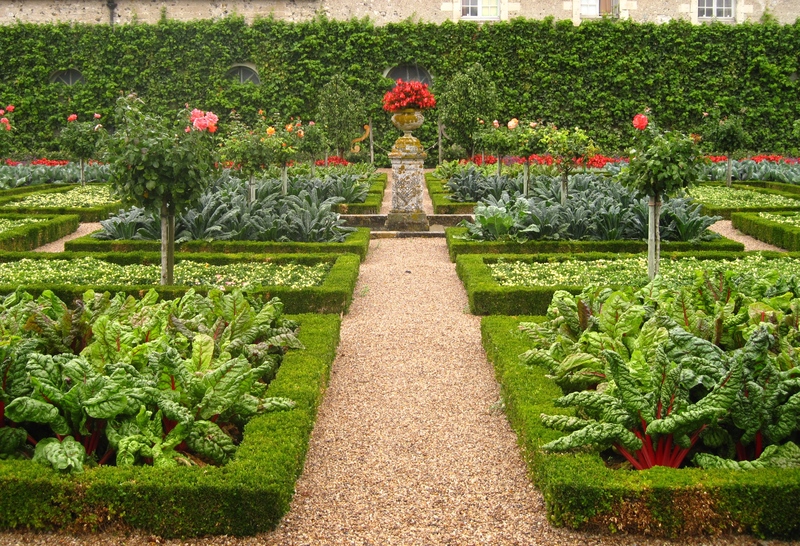 A very elegant potager. Viewed from a floral parterre several levels up. 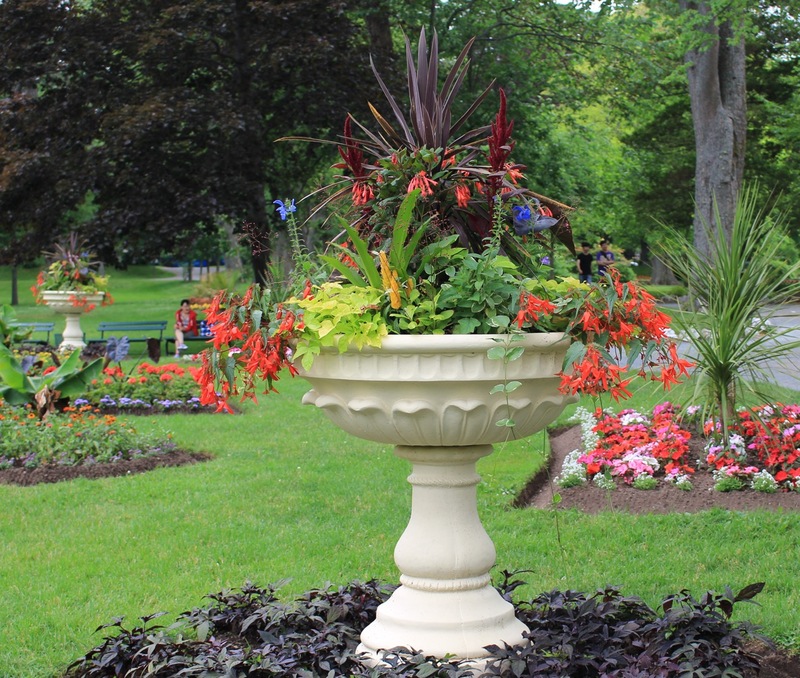 Last but by no means least … the Halifax Public Gardens. It has enriched my life immeasurable and has led me down a path I would never have anticipated. We hope to see you (well maybe not all 414 of you 🙂 this coming Thursday, December 11 at Horticulture Halll between 5-7PM. 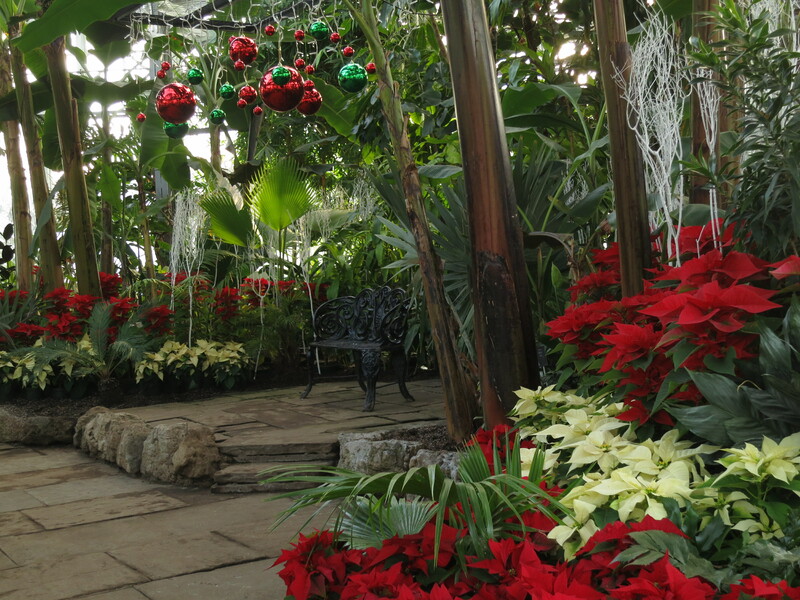 Come celebrate the holiday season with The Friends of the Public Gardens. (FYI: we only take cash or cheque for calendar and other PG themed purchases. A cash bar will be available). Merry Christmas, Happy Hanukkah and Happy Holidays. Be safe and enjoy spending time with people you care about. May all your challenges in 2015 be an opportunity to grow. Happy New Year, Bonne Aneé, Feliz ano novo y Feliz año nuevo. We often consider these plants to be nothing special and we’d sooner have something less ordinary in our gardens. The thing about common plants is that they tend to grow well in their native (or similar) regions. That’s why they’re so popular. I’ve just spent the late summer and fall in the Balearic Islands of Spain and the Pyrenees in France. Many of these exotics are available in good nurseries around Nova Scotia but they don’t come cheap. 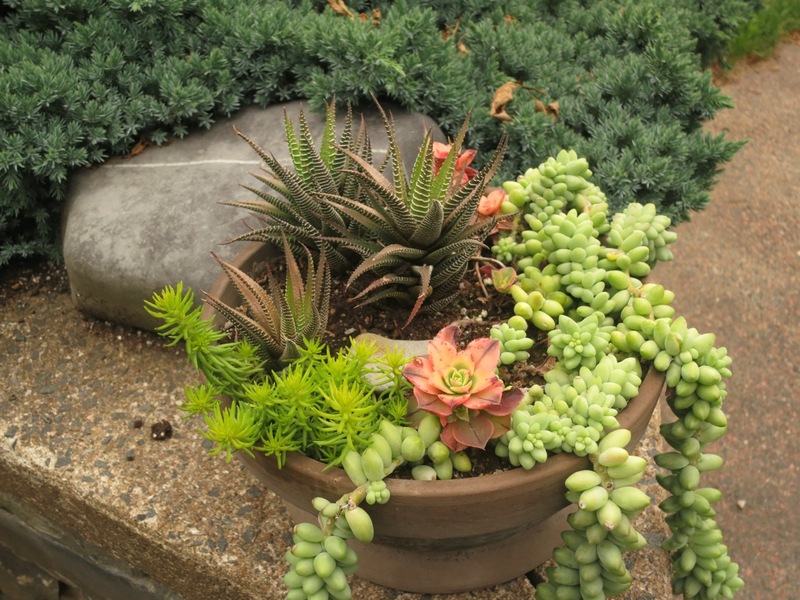 Some of them are featured in our Tropical Display bed at the Gardens. In their preferred habitat they were so plentiful! So cheap! And oh so… common. The locals were perplexed by my enthusiasm for these ordinary plants. However what is common to some folk are exotic to others. 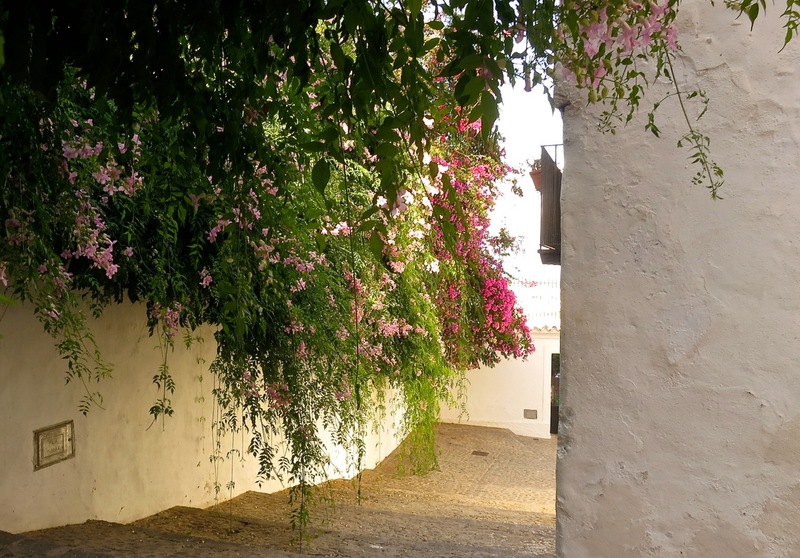 Is there anything more charming than coming upon a narrow stone lane with Bougainvillea spilling over a wall? I’ve seen some atrocities committed against this rambling vine, pruning it to within an inch of its life to contain its natural exuberant tendencies. Like a new love interest… forget about changing them. Love them for what they are or move on. 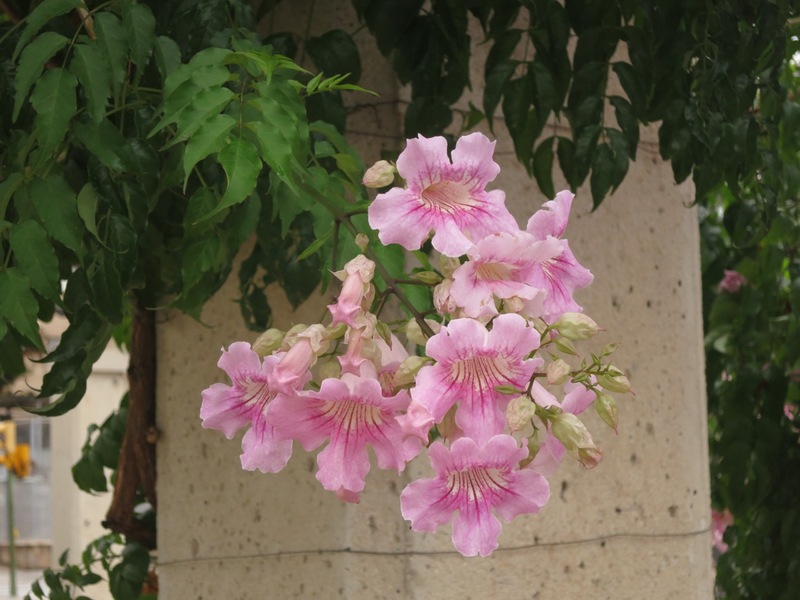 The Pink trumpet vine (Podranea ricasoliana) vine is as vigorous and commonly used as the Bougainvillea. It is the pale pink vine growing alongside the fuchsia Bougainvillea in the last photo. The Nerium oleander (Oleander) was named because of its resemblance to the Olea (the olive tree, another VERY common plant in these parts. In fact it’s one of the main crops in the area). In Mallorca the Oleander is as common as our Rugosa roses (Rosa rugosa) and is used in the same manner… as a hedge to screen busy roads. The difference being that rose hips are a beneficial supplement while all parts of the Oleander are poisonous. 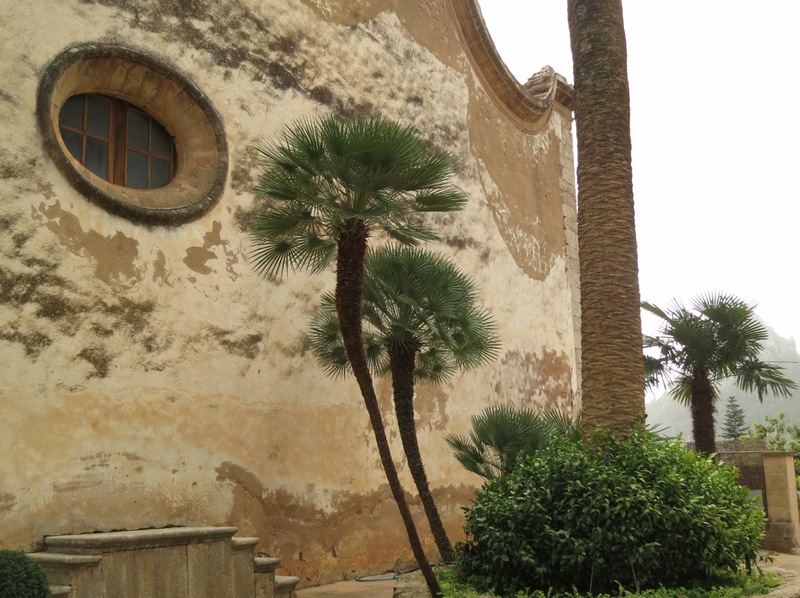 Palm trees are a common site in the Mediterranean. Unfortunately so is the red palm weevil which arrived in Spain in 1994 from Egypt and has since spread into France and Portugal. 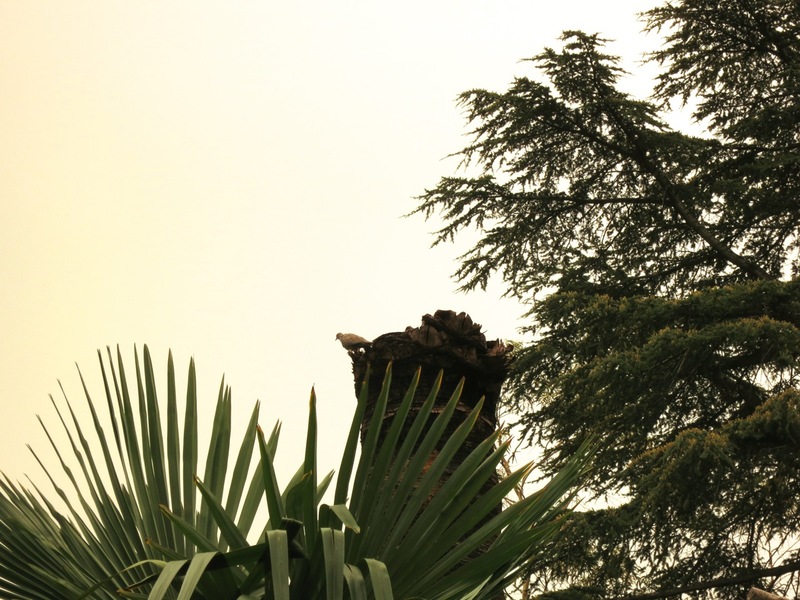 It now affects 50% of date palm growing countries in the world. The red palm weevil has turned this palm tree into a dove perch. The weevils bore holes in the trunk affecting it’s vascular system and causing the canopy to die back, starting at the crown and moving onto the lower leaves. 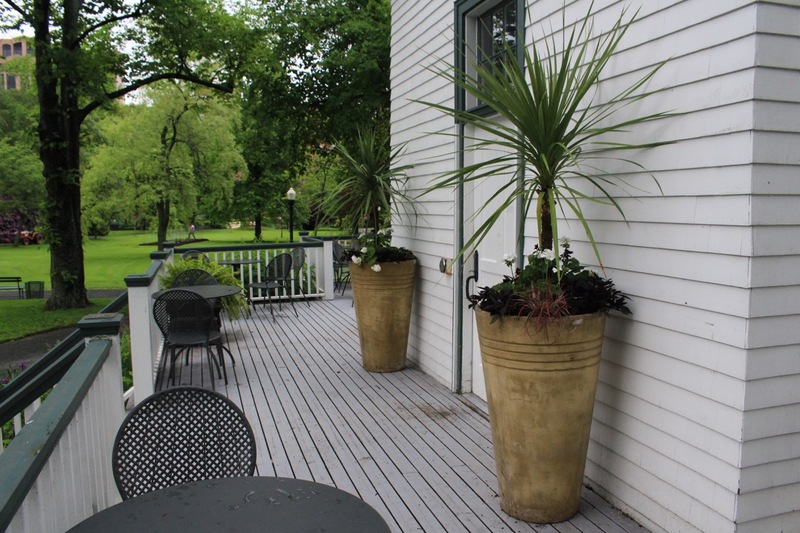 Container gardening on balconies is often the only type of garden one can have. 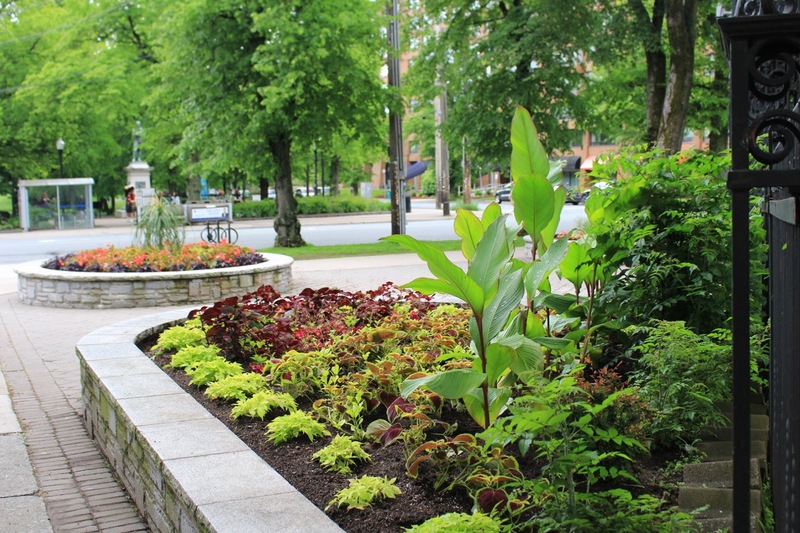 Drought resistant plants are the perfect solution in low water, high heat environments and the Med has many ‘common’ plants to fit the bill. Some results are less common than others. 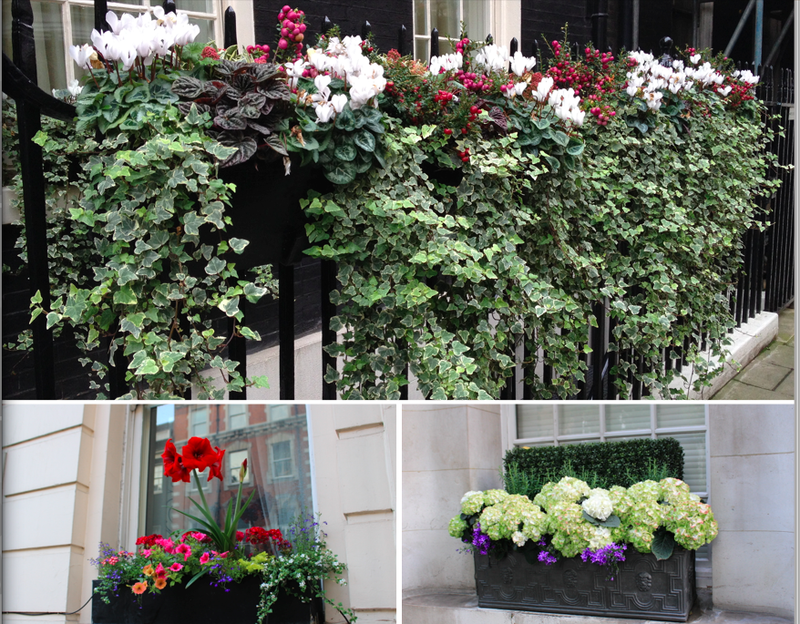 Balcony gardens come in many forms. This one is very simple (plant wise) and very striking. (Note the Oleander hedge separating this apartment building from the road). 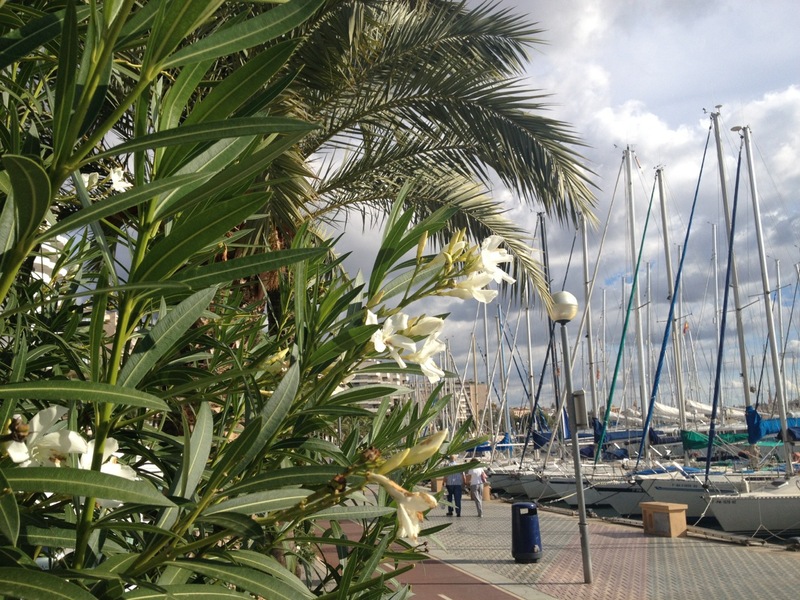 Chamaerops humilis (Fan palms) are the only palm trees native to Mallorca. 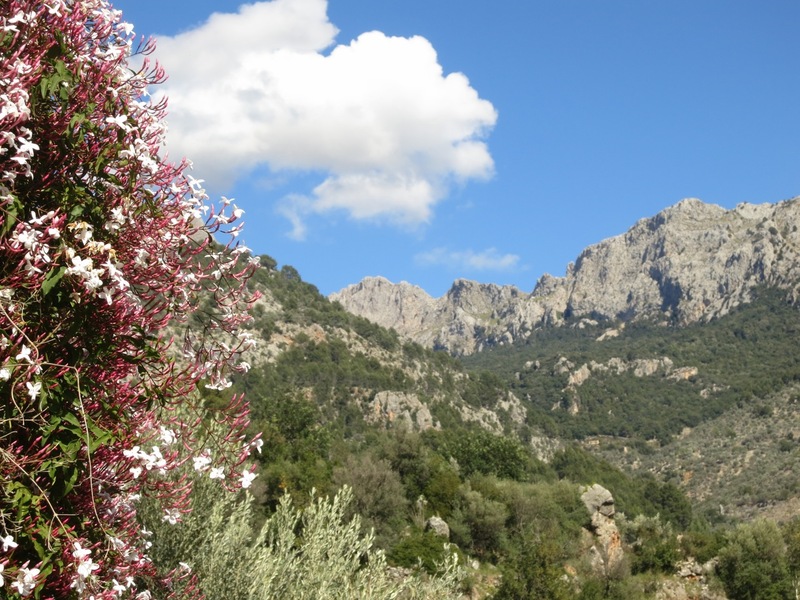 They grow all over the island, particularly in the rocky slopes of the Tramuntana mountain range, though those are a shorter variety than this one. 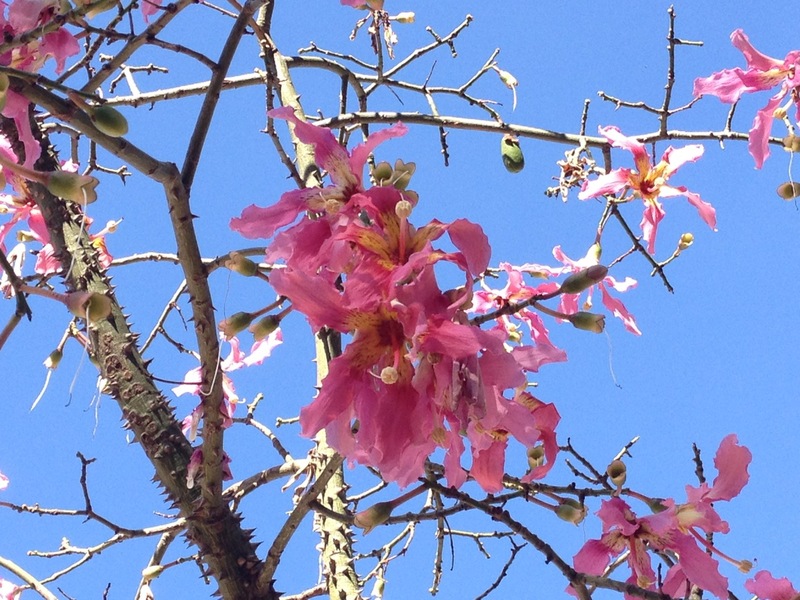 I was first drawn to the Ceiba speciosa (Silk floss tree) because of its bulbous spiny trunk. The spines are water storing vessels. Then I came upon these gorgeous orchid like flowers and when I looked beyond them, I realized they festooned the spiny trunk I was so mesmerized by. I had been photographing them all over the island during the winter when they were leafless. Who needs flowers when you have glorious orange glochids emerging from the smooth blue/green leaves of this Opuntia (prickly pear cactus). I’m not sure what variety this is but I’d like one. 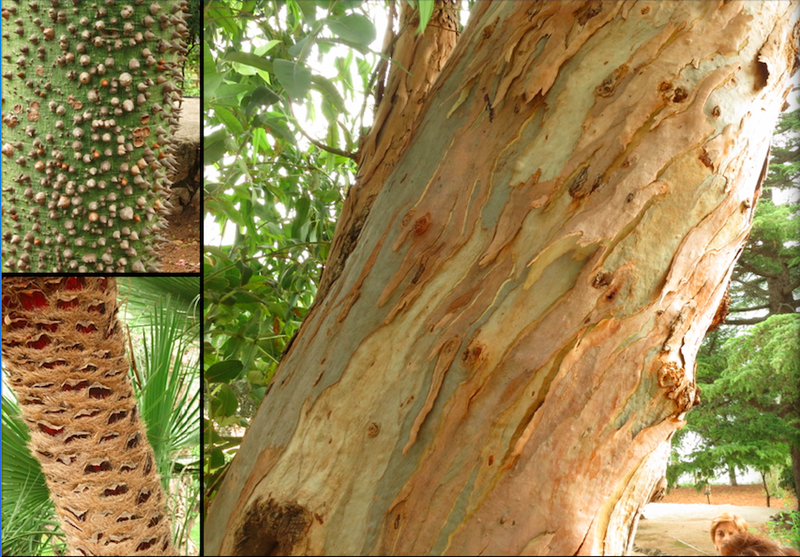 Ceiba ,Chamaerops, and Eucalyptus trunks create interest in the gardens of Alfaiba even in the winter. I thought this was a root but it turns out it’s a stalagmite formed by dripping water. This formation occurred outside, not in a cave. The water in Mallorca has a very high level of calcium carbonate and isn’t fit to drink untreated. 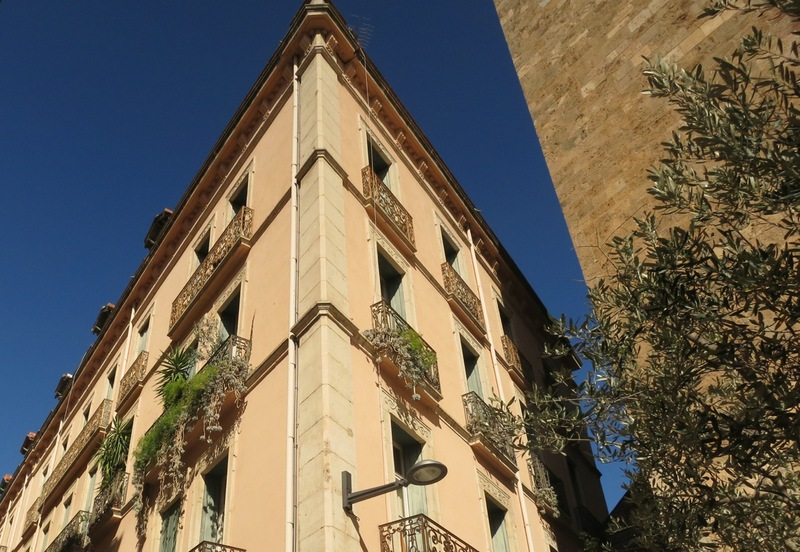 Behind some pretty plain facades are some beautiful courtyard gardens in Mallorca and Perpignan. While this courtyard in an old historic building (now a Municipal government office) didn’t have any particularly interesting plants, it had some gorgeous hardscape features, including these painted tiles. 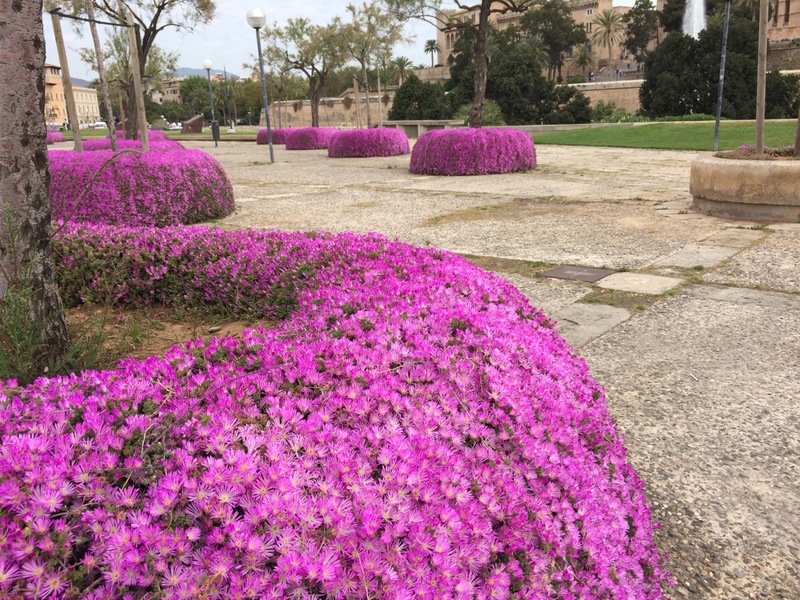 I may have seen literally thousands of Bougainvilleas during my visit to Spain and France but there were times that they literally took my breath away. A weeping Olea europaea (Olive tree) makes a simple but beautiful display, mimicking the spouting water. A great garden, like a great meal, is more about what you create with the basic ingredients than the ingredients themselves. 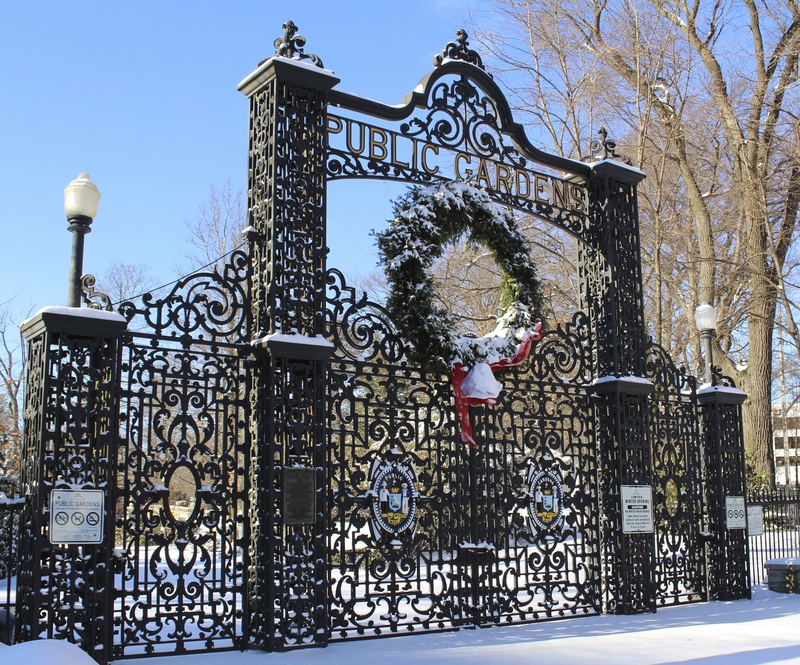 The Public Gardens close their gates early this year. Sunday, November 16 in the early evening. If you get a chance, go in for a last walkabout. The Friends will be hosting their annual Holiday Celebration on Thursday, December 11 from 5-7Pm at Horticultural Hall. Invites will be emailed later in the week but we wanted you to pencil us in. In the meantime, stay warm. Hasta pronto! 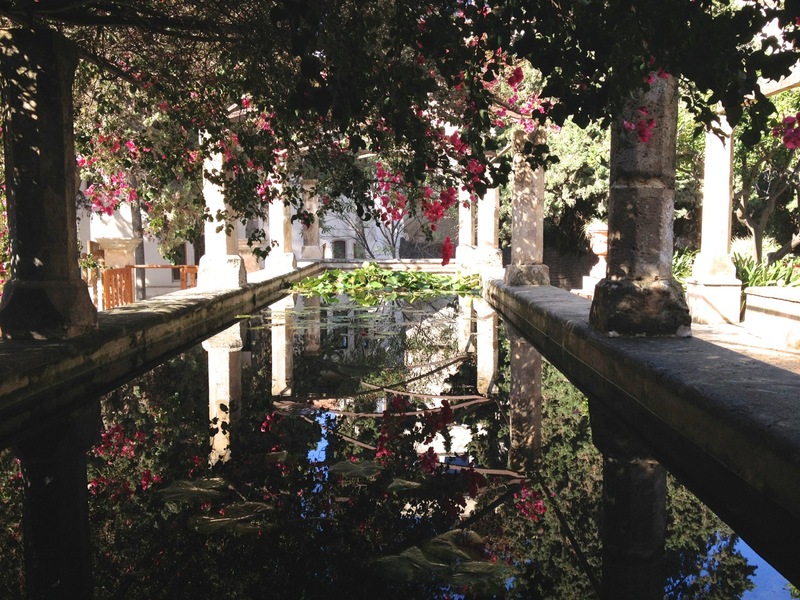 The Gardens of Mallorca (or… why I keep returning). Those of you who follow my photo tours know a couple of things about me. 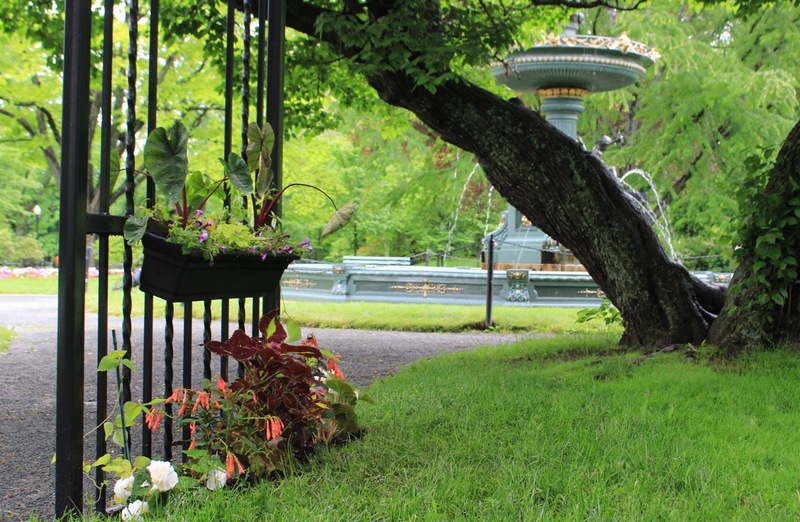 The first is that I love gardens ( the Halifax Public Gardens in particular), and the second is that I love to cycle. My two passions have led me to the beautiful island of Mallorca which is situated in the Mediterranean just south of Barcelona, Spain. My husband and I first came here four years ago to prepare for our cycling adventure across France. We instantly fell in love with this small Spanish gem and its warm-hearted people and decided to make it our winter home. I am slowly getting to know the flora of the island which is quite different from ours, as this is a warmer and much drier place. 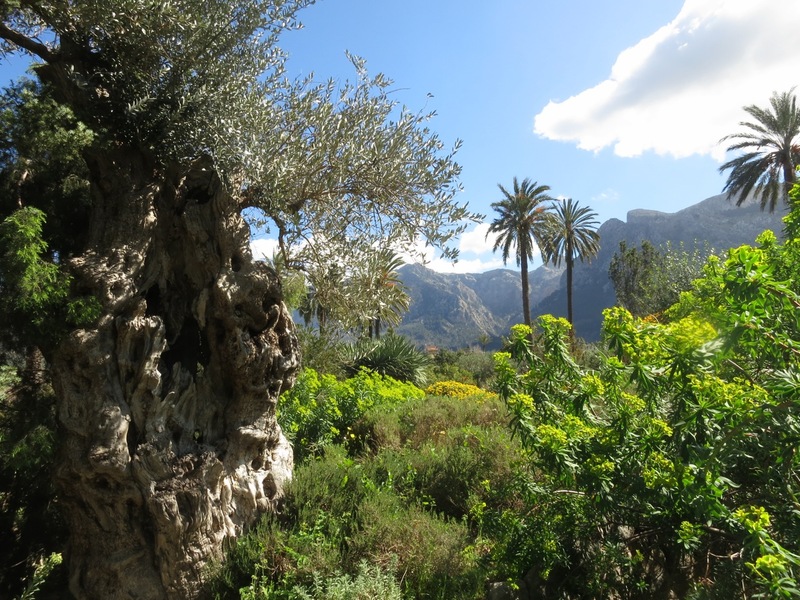 This is a land of oranges, olives and almonds, Bougainvillea and cacti. 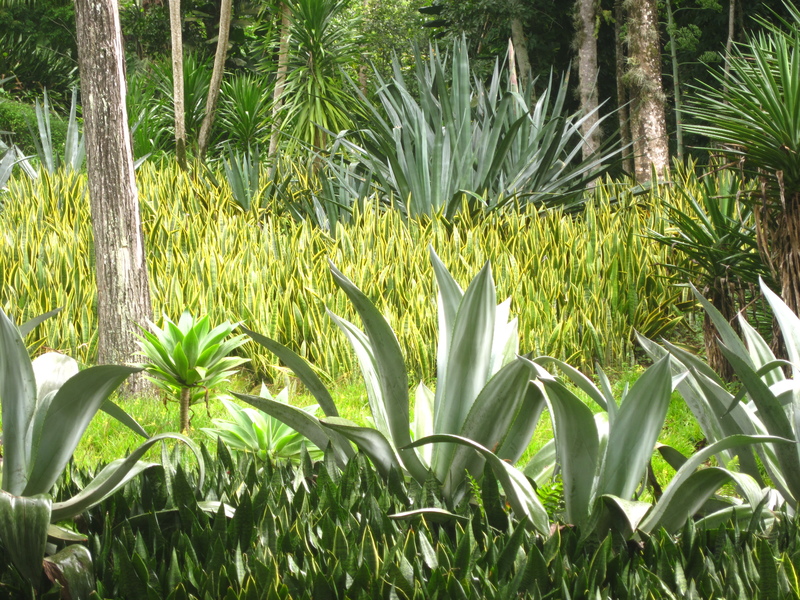 Agaves grow like weeds here (like in Australia). Lush is not a word you would associate with Mallorca. Orange trees are used extensively in landscape designs around the island because of their colorful fruit and their highly scented waxy white flowers. The fruit from this variety aren’t valued for their flavor. 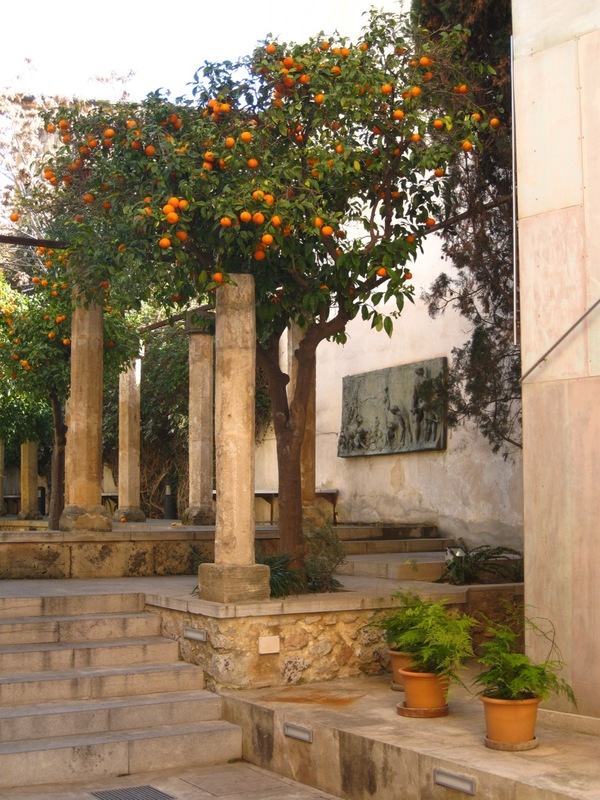 Soller, a valley located in the Taramuntana mountains on the Northwest of the island, was a major orange grower and exporter in the mid 1900 until their crops were wiped out by disease. 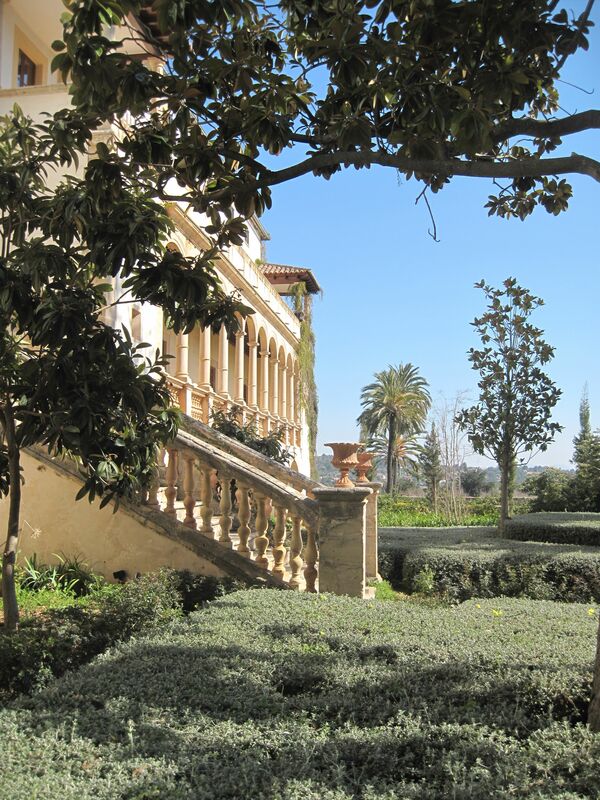 S’Hort del Rei sits below the Almudaina Palace in the capital city of Palma, and like many of the important gardens around the island, was designed or influenced by the Moors, who occupied the island from 900 to 1200. They introduced irrigation to this parched island which only has 74 rain days a year (one of the reasons why I spend time here). 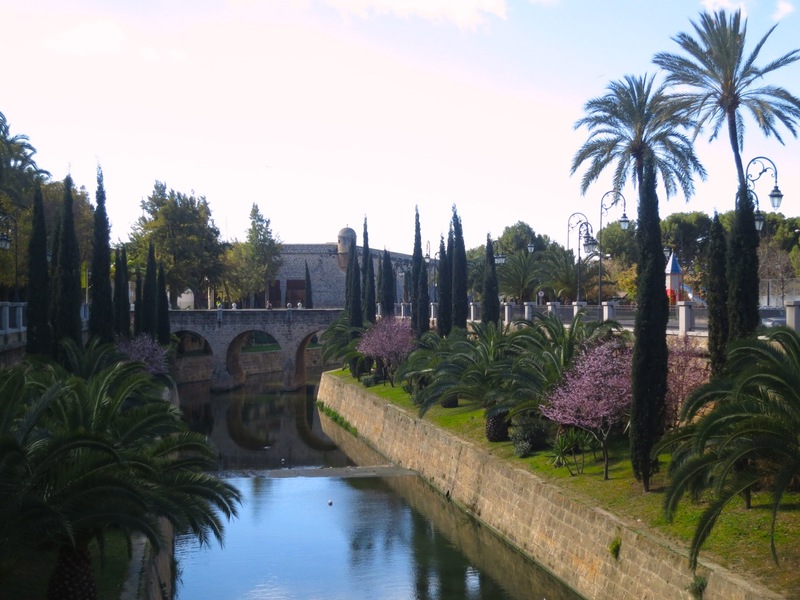 As Mallorca has few rivers, torrentes (canals) have been built to direct the heavy rains of winter from the mountains toward the sea. During the summer they are totally dry. 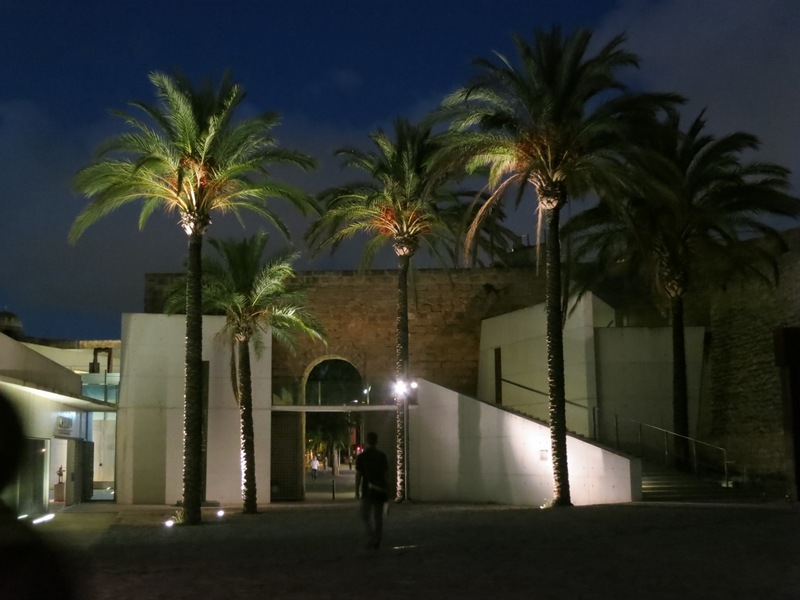 The Torrente de Sa Riera which runs down the center of Palma, has been beautifully landscaped and is lit up at night. 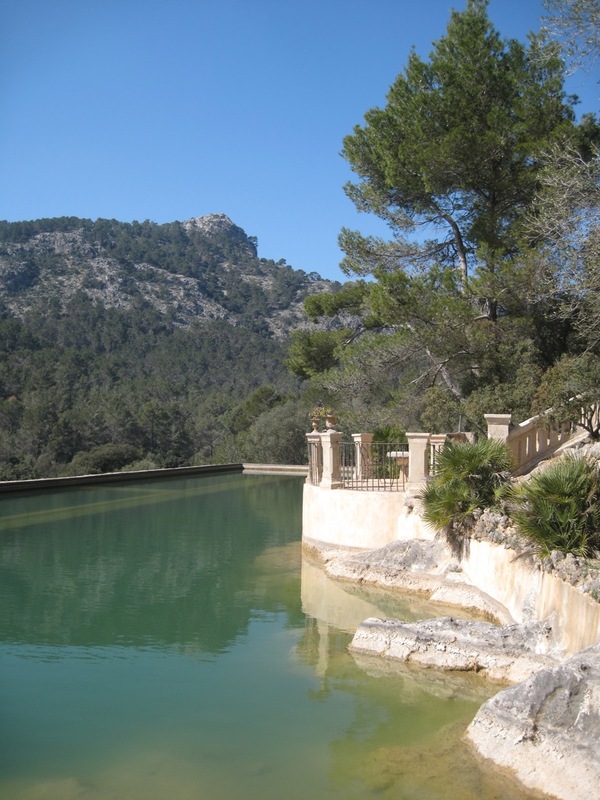 Raixa is a 12 century garden which was recently renovated by the government of Mallorca. 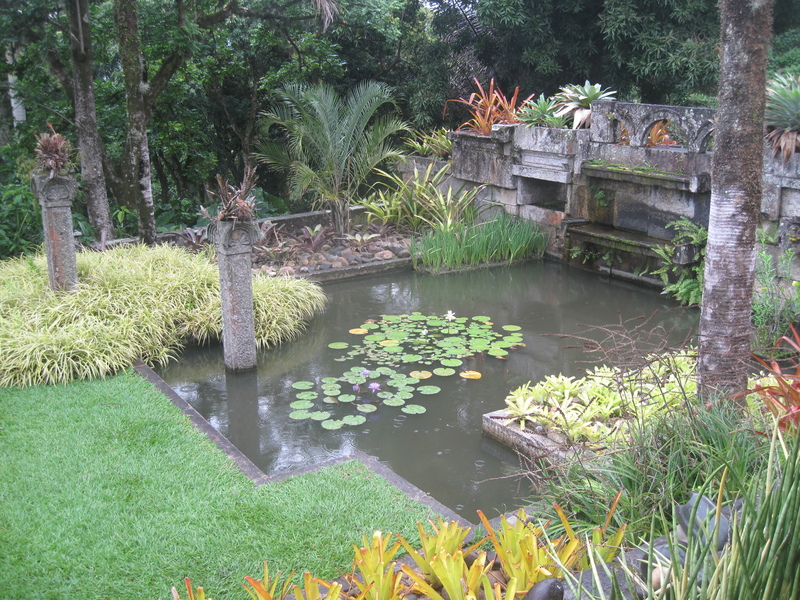 It was originally designed by the Moors and like most of their gardens, water is a prominent feature. 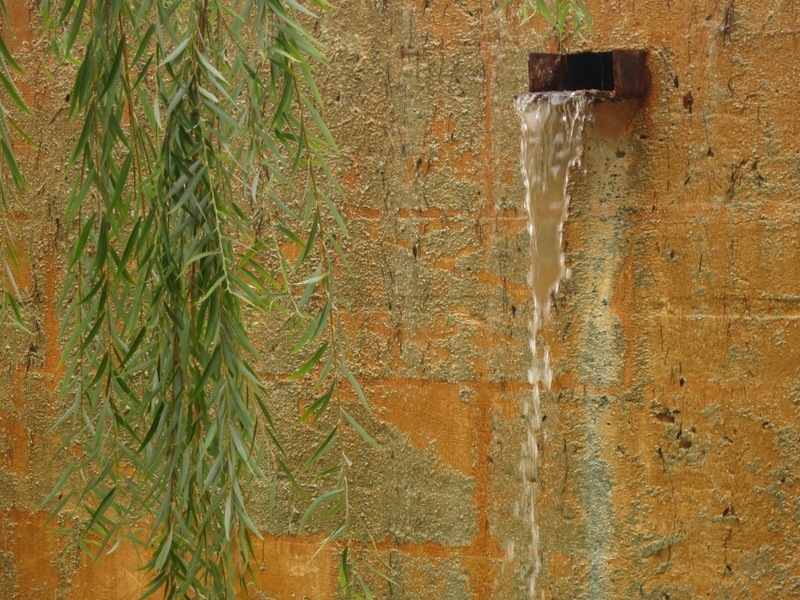 The garden tumbles down a mountain, and rainwater is ingeniously collected and distributed through a series of very esthetic pools, runnels and fountains, watering the plants and orchards along the way and reserving the rest for later use. 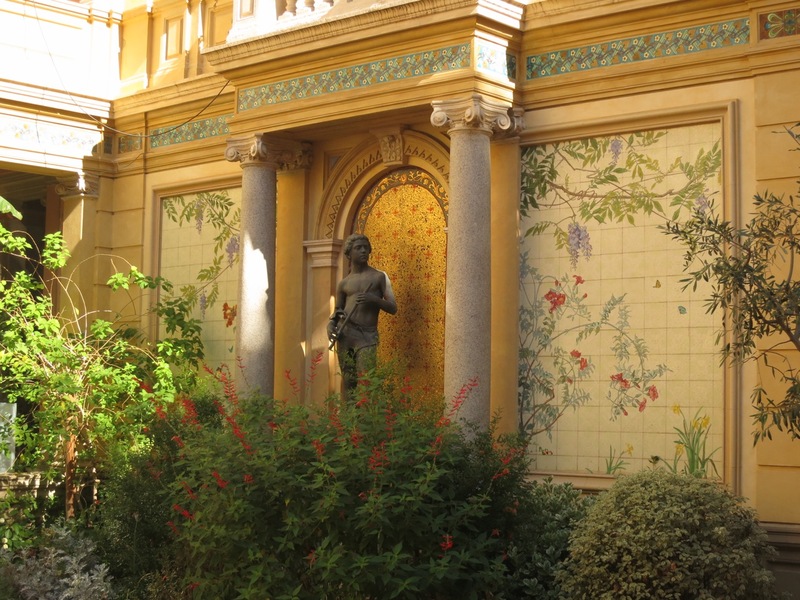 The forecourt of Raixa features another Moorish garden element – shade. 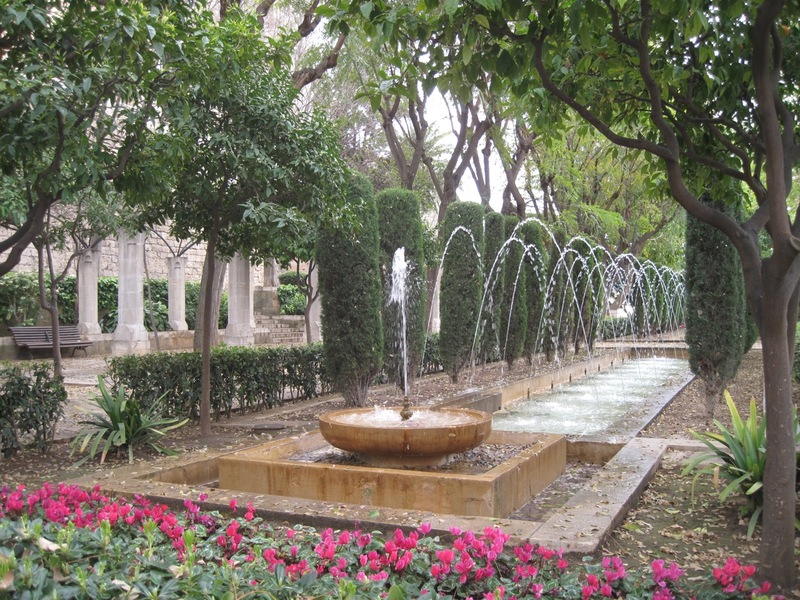 Traditionally Islamic gardens feature both water and shade (both rarities in Mallorca). The water reservoir at Raixa looks more like a pool, and features huge carp. 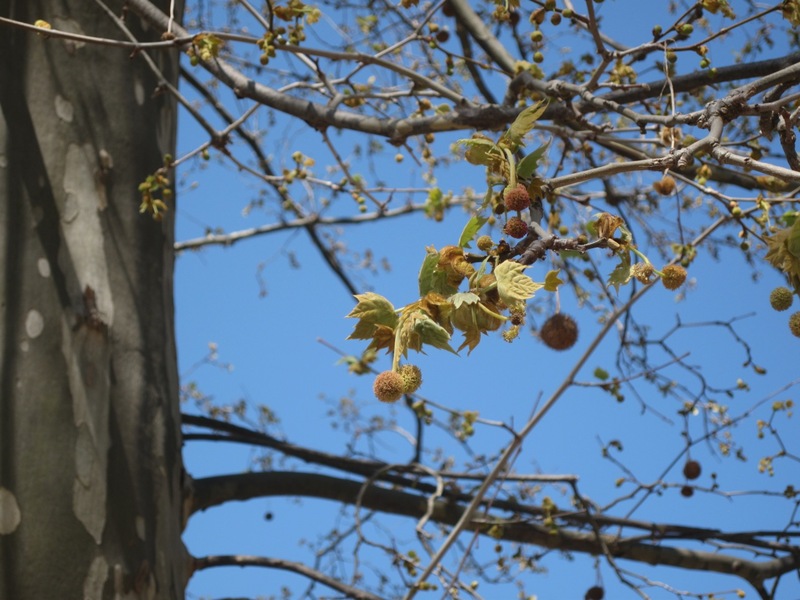 Platanus trees are everywhere in Mallorca and in Europe as well. 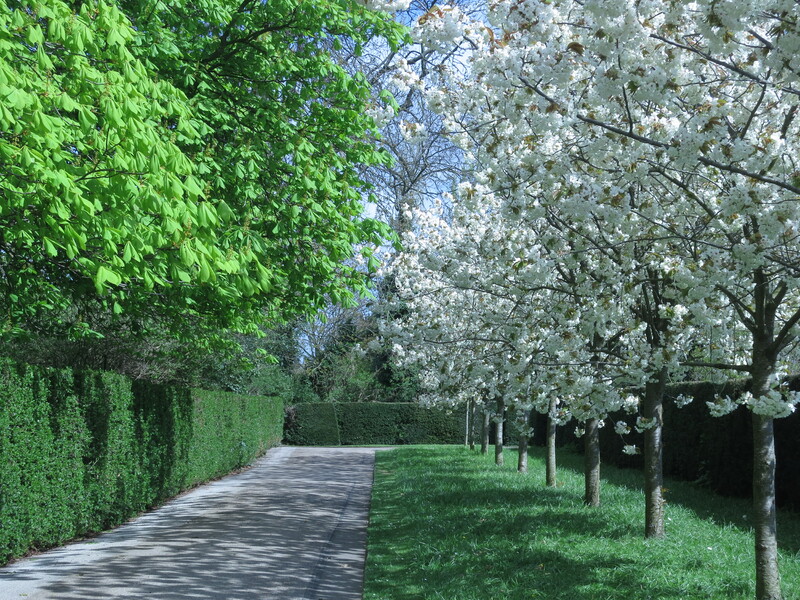 The Grande Alleé at the Gardens were fashioned after the European ones which are usually planted with Platanus (Plane trees). Jasminum grandiflorum (Spanish Jasmine) a member of the Olive family have begun to bloom everywhere and in the last couple of weeks dispersing their sweet scent . Olea europaea (Olive trees) are numerous and ancient on this island and produce the most wonderful fruit and oil. In fact the botanical name means ‘Oil of Europe’ and it has been attributed to prolonging life expectancy. Their gnarled silver trunks are an attraction in their own right. 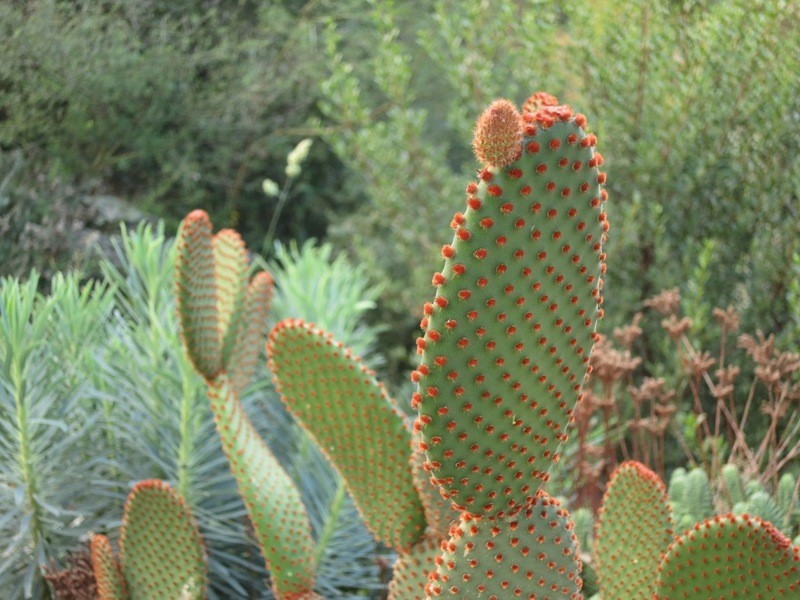 The Botanical Garden in Soller exhibits plants typical of the Balearic and Canary Islands. It sits in a valley surrounded by mountains, making it difficult to focus on the plants. 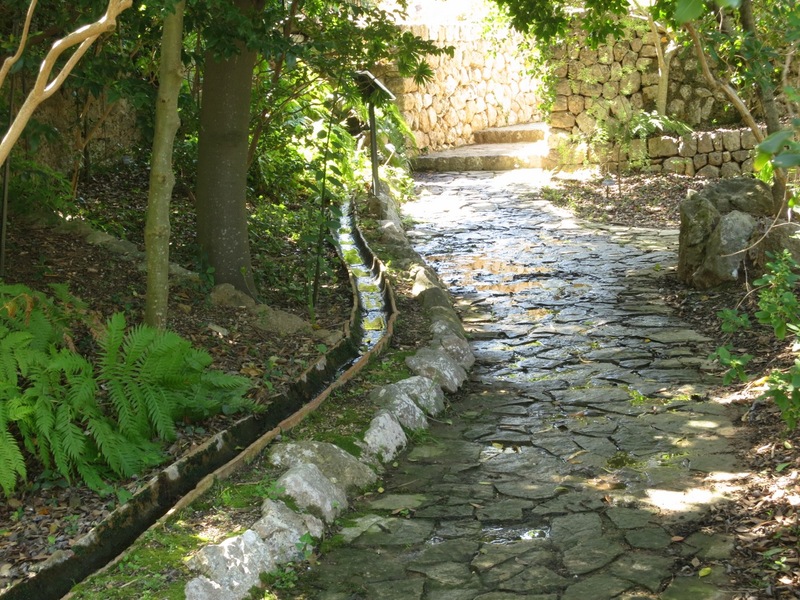 Runnels disperse the water throughout the Botanical Gardens, a common feature of gardens everywhere here. 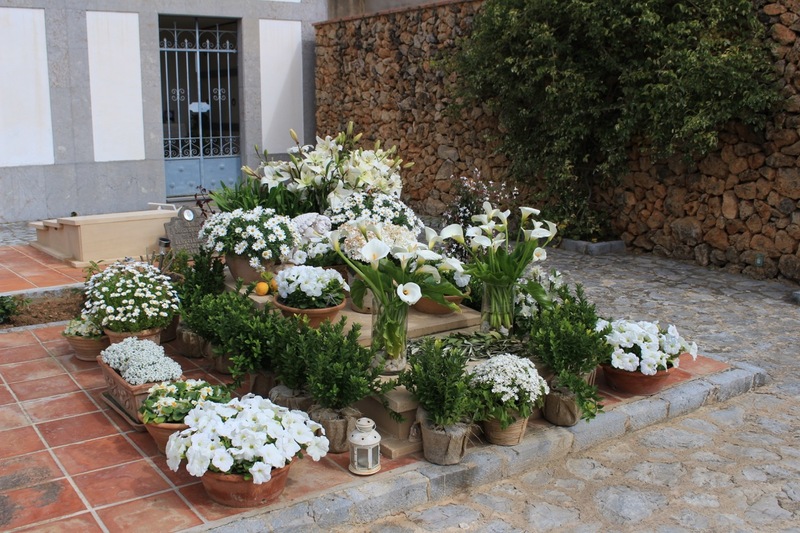 Aeoniums (a native of the Canary Islands) are found everywhere in Mallorca. I have one as a houseplant at home, but it has never flowered so I was surprised by these red flowers. 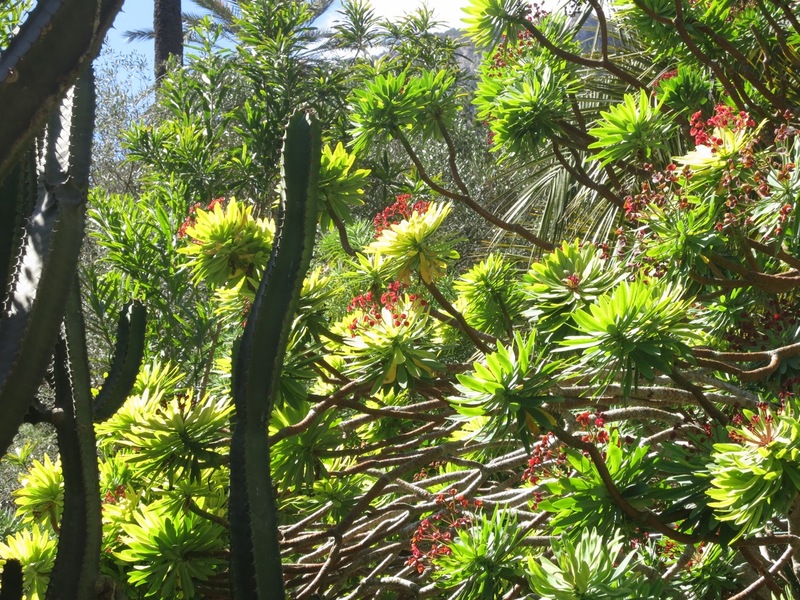 They reminded me of the Euphorbia milii (Crown of thorns) we have in the Tropical display beds at the Gardens. I spotted this large clay pot filled with what I thought was a grass with pink tips. 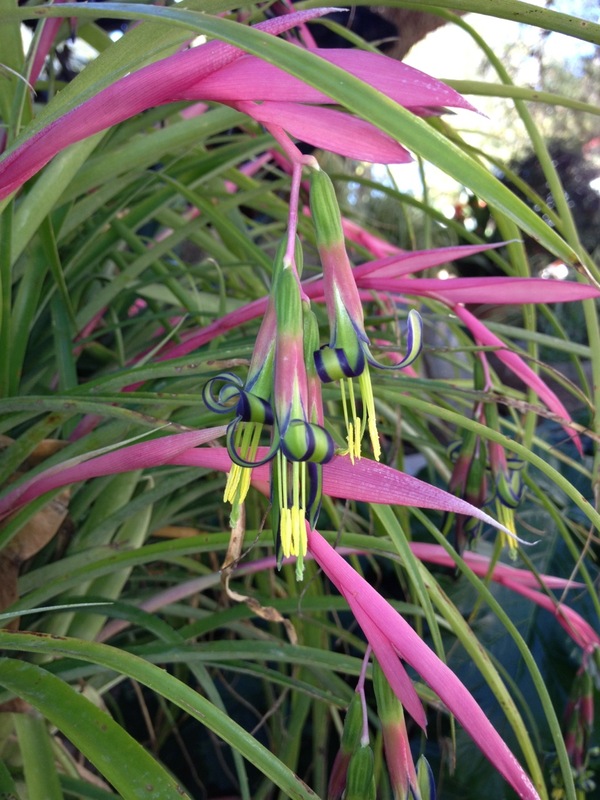 On closer inspection the pink tips turned out to be stems from which descended the most interesting flowers. 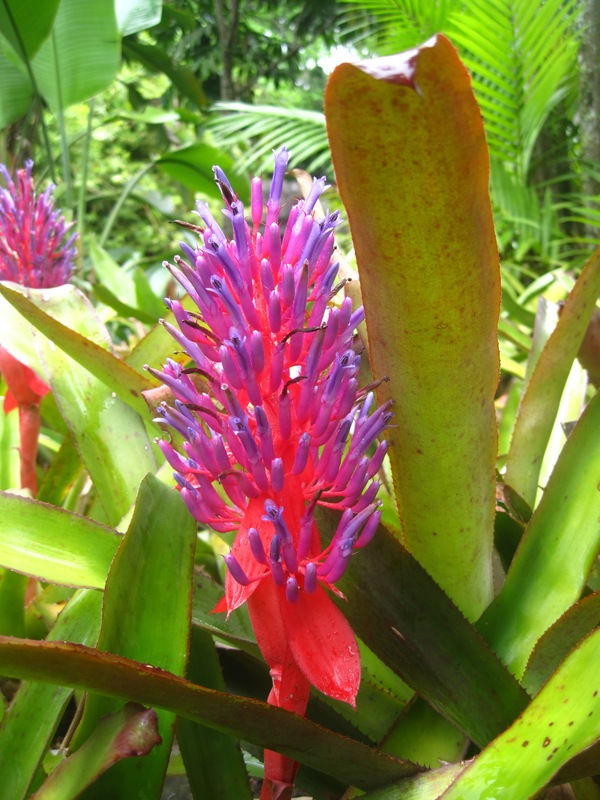 It proved to be a bromeliad named Billbergia nutens (Queen’s tears) from Brazil (no wonder I loved it) .According to Wikipedia, it’s the most common Bromeliad grown… common where? I snuck this one in. This garden is in the Alcázar of Córdoba on the mainland. During Easter weekend I toured Córdoba in the pouring rain (the most rain they’ve had in 50 years). This corner of the garden lifted my drenched soul. So did the Mesquita and the wonderful food, but that is another blog in itself. I apologize for not having posted sooner. I had that dreaded flu for the whole month of January, then I left for Spain and time just slipped by. 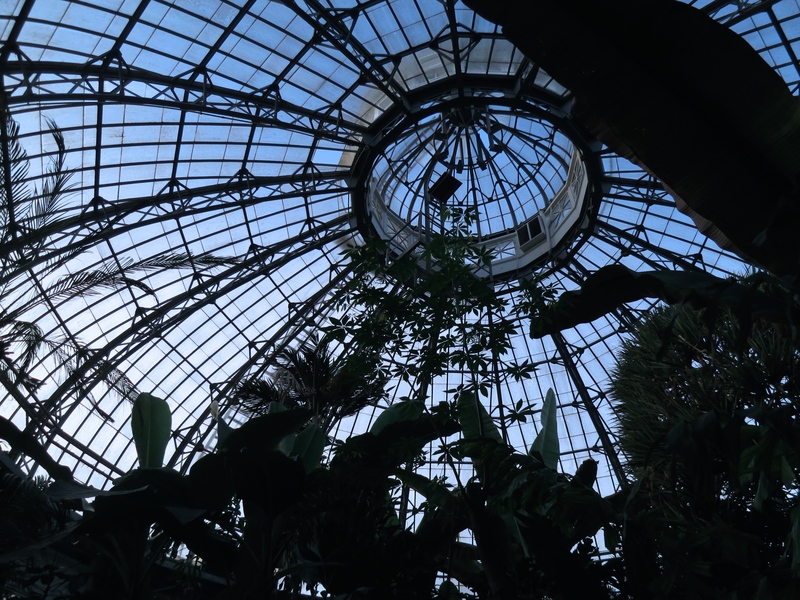 On Monday the Gardens re-open for the season (feels weird saying that since they have occasionally been open this winter). 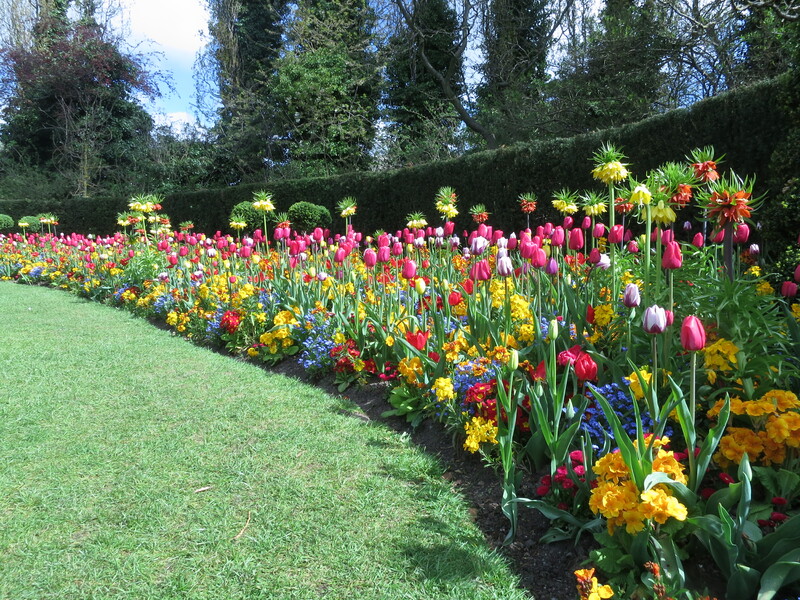 I know it’s been a hard winter but soon the sun and the warmth will return and we’ll once again be moseying down the Gardens path. I don’t return until the end of April so I won’t be sharing any photos until the beginning of May. I can’t wait to see what’s popping up. 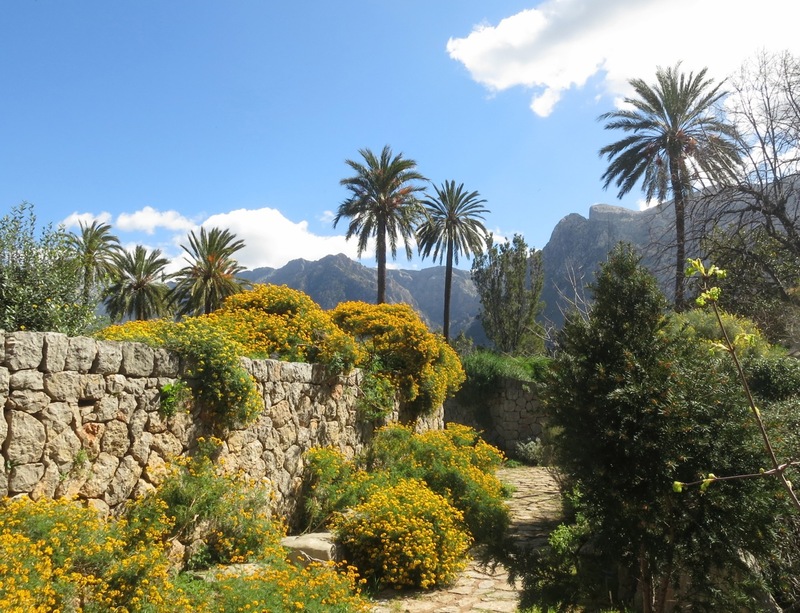 Author SerenaPosted on April 10, 2013 Categories beyondthegardens, photo tourTags agave, Alcázar, beyondthegardenspath, flora, Mallorca, Raixa, Soller Botanical Garden, Torrente de sa Riera14 Comments on The Gardens of Mallorca (or… why I keep returning). Off the Gardens path we go….at least while our beloved Public Gardens are asleep. A kid in a candy shop was how my husband described me on a long overdue visit to the gardens of Burle Marx just outside Rio de Janeiro. Mr. Marx is most famous for designing the black and white, stone mosaic sidewalk of Copacabana beach in Rio de Janeiro, Brazil. 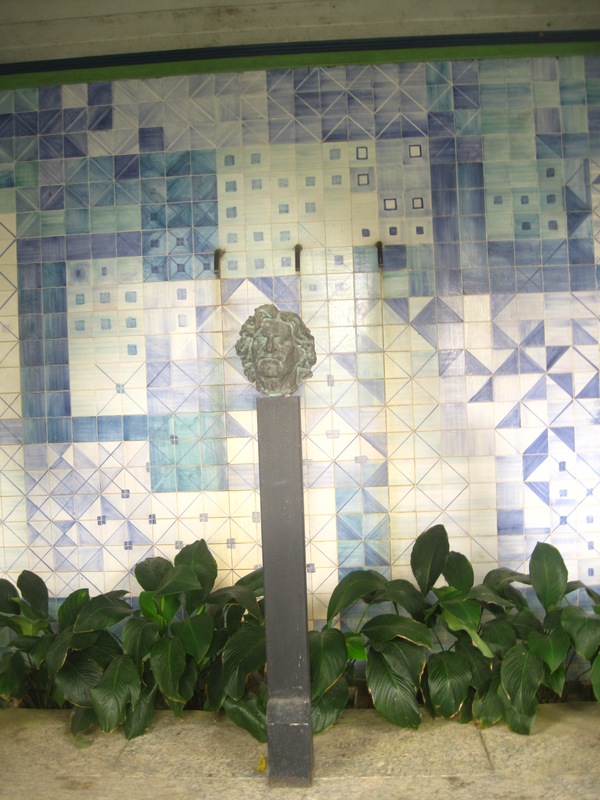 As a landscape architect, he designed many famous public spaces in Brazil but he considered himself an artist first, then a botanist, then a landscape architect. This is evident in the garden which he lovingly evolved over 46 years, filling it with 3500 species of predominately native plants. The roots of this 80 year old tree, refuse to be overlooked. 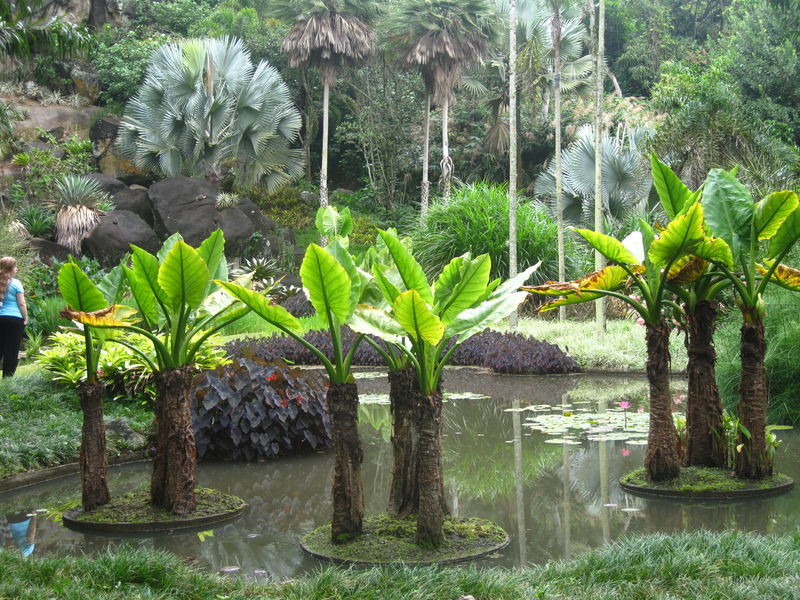 They have risen above the ground to anchor the tree on the slope.There is no way Burle Marx could have planned the prominent role these roots would one day play… or did he?They are the first thing you notice upon beginning your tour of his gardens. Sansevieria trifasciata (Snake plants) are used as a backdrop to emphasize the architectural shapes of the Agaves. 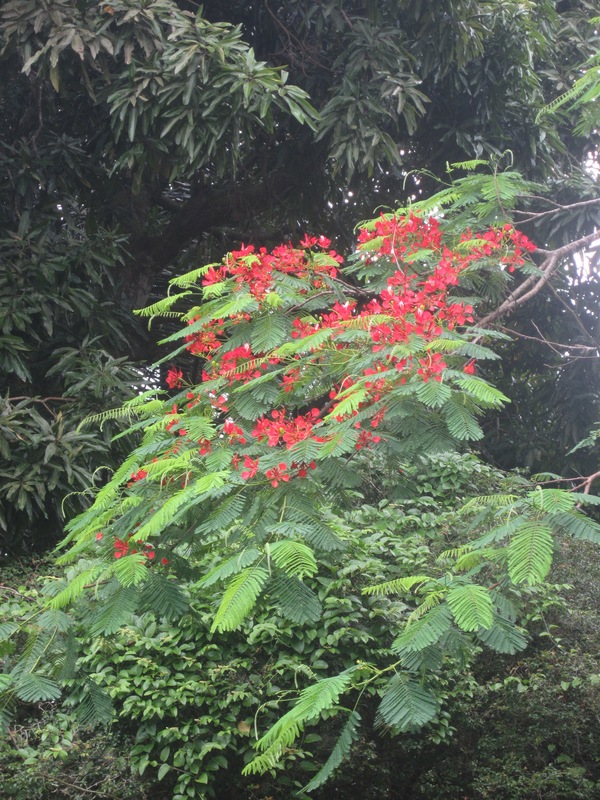 This aptly named ornamental tree begins its ‘flamboyant’ display of crimson flowers paired with lacy fern like leaves. While studying painting in Berlin, the 18-year-old Burle Marx had an epiphany during a visit to the Berlin Botanical Gardens. 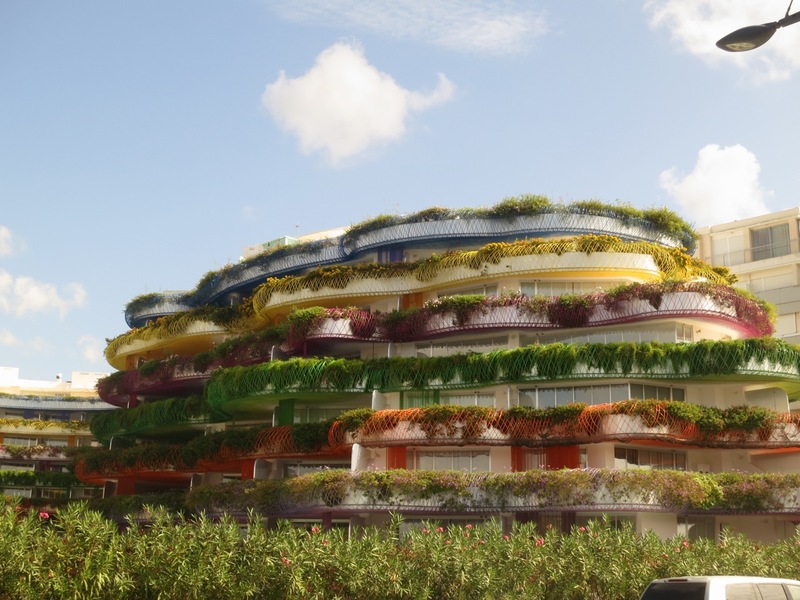 There, he encountered beautiful plant species native to Brazil, and vowed that upon his return he would design gardens using native species instead of the imported plant materials favored by Brazilian landscape architects. 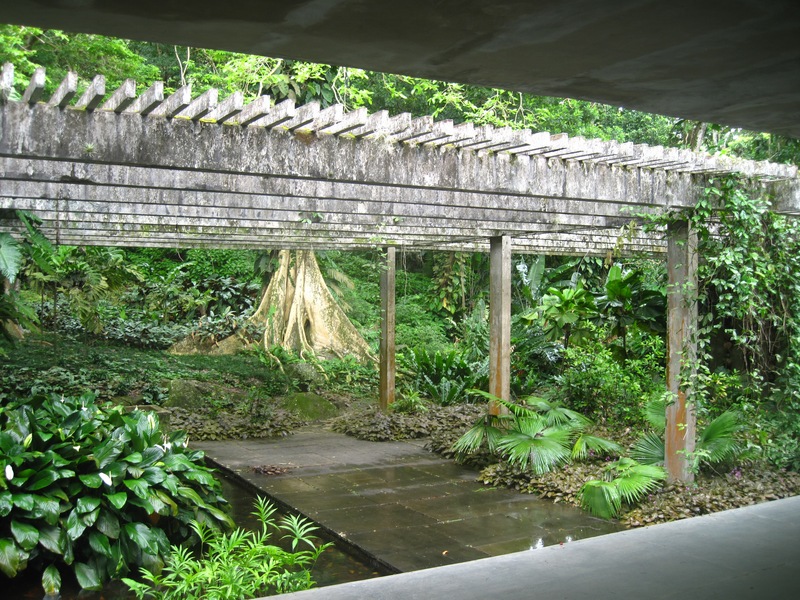 In doing so, he revolutionized landscape design in Brazil, being on the leading edge of conservation, preservation and the utilization of native species. Other than the water lilies and the flowers on the Flamboyant tree in the background, this colorful water garden is composed entirely of foliage plants. 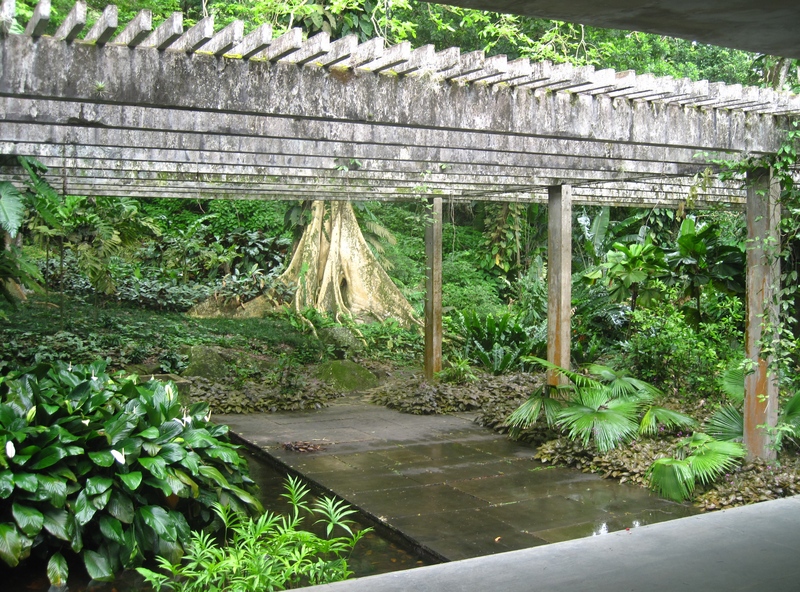 Burle Marx a man after my own heart, loved a good party and built this open air ‘party room’ behind his house at his ‘sitio’. This modern space is surrounded by a water feature, contains an open fireplace and was designed to frame the surrounding gardens. 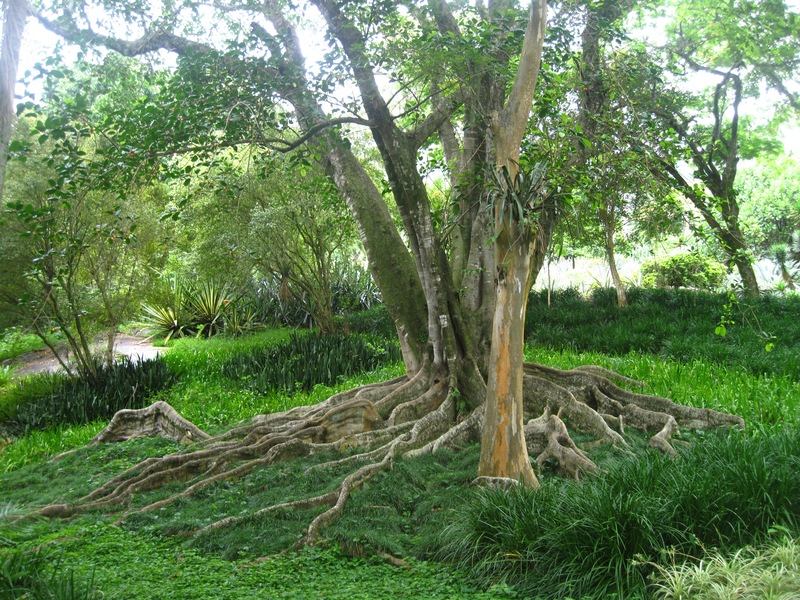 This particular view looks toward the root flare of a huge Ficus tree. To think that prior to the influence of this wonderful artist, Brazilians imported Pines and Gladioli for their gardens instead of using ‘inferior’ local species. 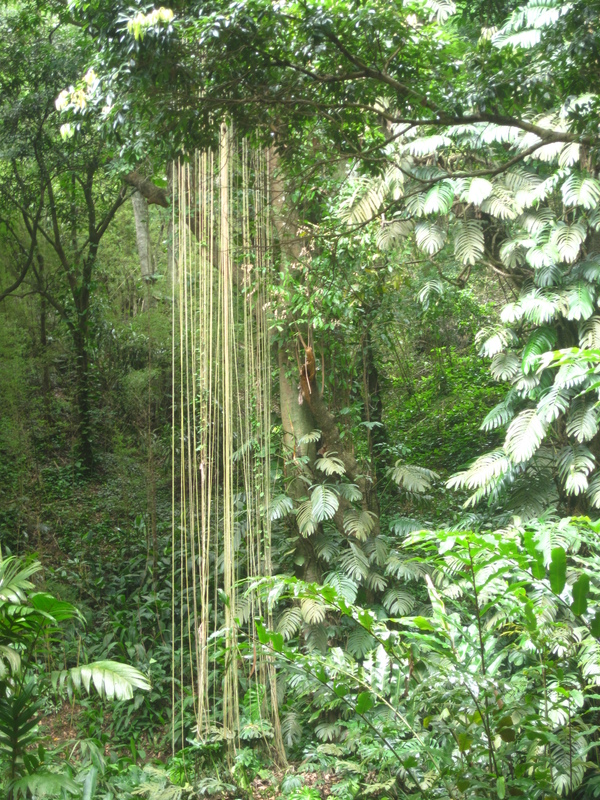 The roots of this Philodendron plant growing in the canopy of a tree, spill down to the ground creating a surreal waterfall. Philodendrons begin life in the canopy of trees, then send aerial roots to the forest floor where they can uptake their nutrients. 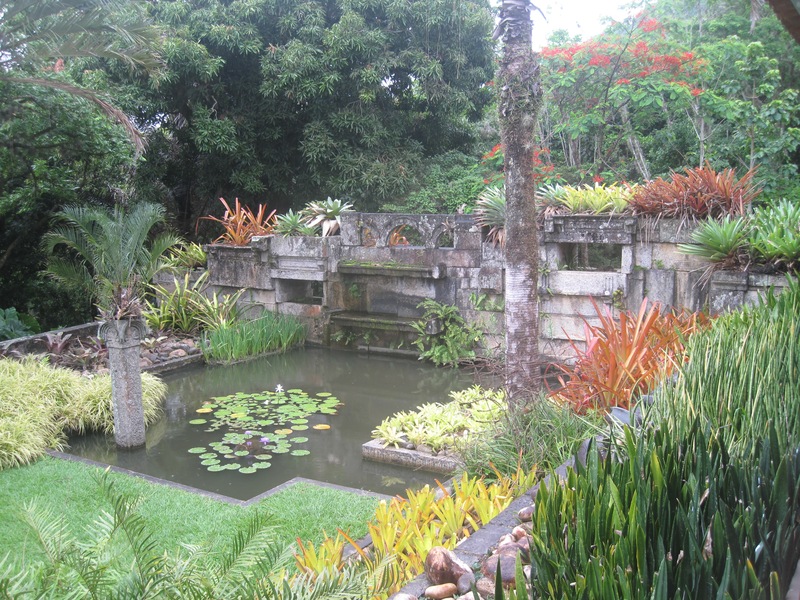 Burle Marx was a master at his craft, but Mother Nature invented good design by combining beauty and function. Design magic! 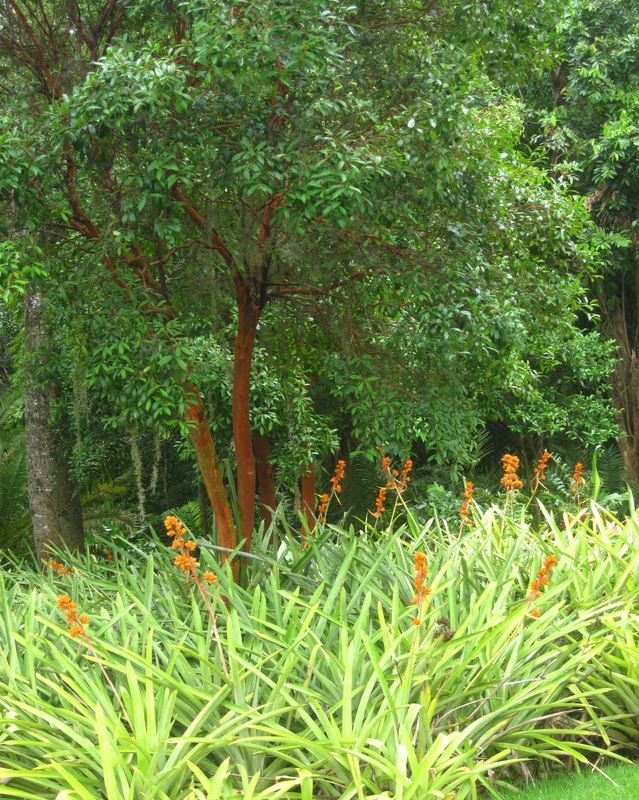 Pairing the flowers of these Bromeliads with the similar colored bark on this (unknown to me) tree. 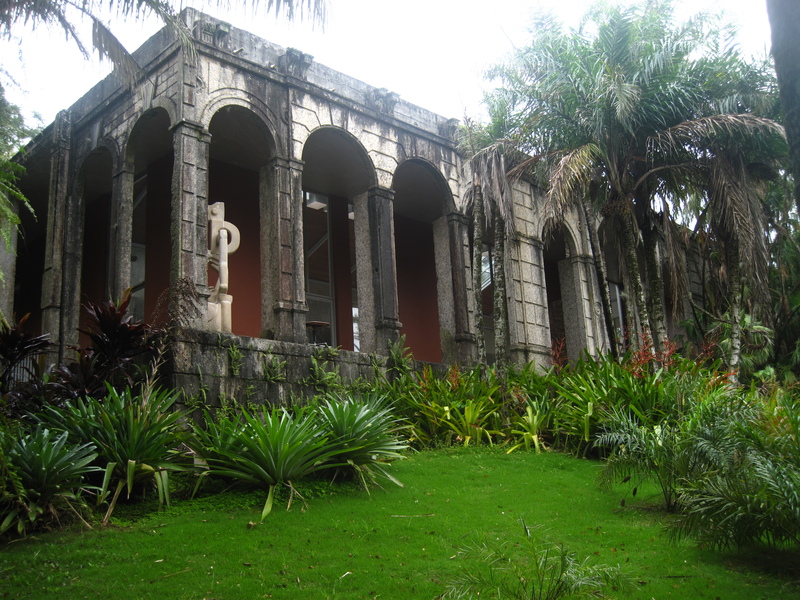 This XVIII century logia was disassembled from the center of Rio de Janeiro and reassembled at the ‘sitio’ in 1990. It fronts a contemporary building Mr. Marx planned, to use as his art studio. He began this project at 80 years old and unfortunately didn’t live to see it’s completion. He died at 84 years of age. 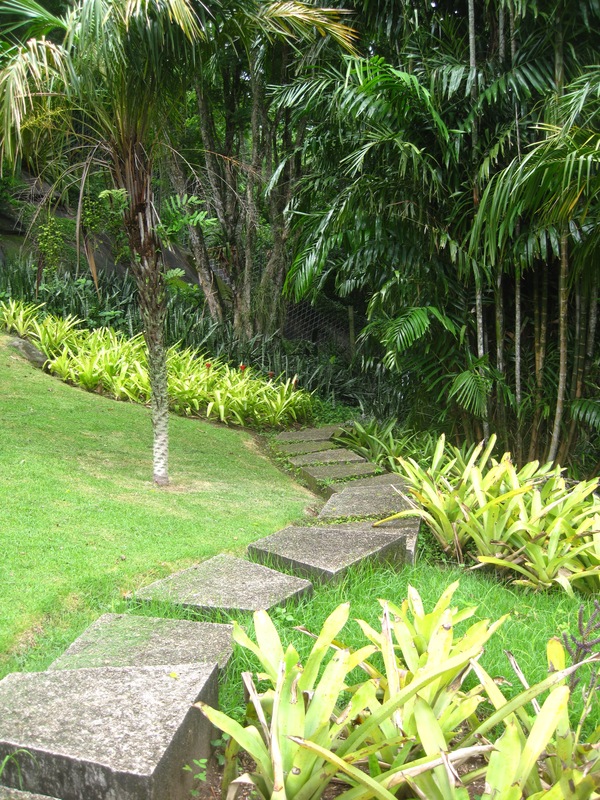 Not for the faint of foot (and a total liability nightmare in North America), theTrilha Trapézio footpath, consists of irregular shaped and sized stepping-stones, descending to the Rock and Pond area of the garden through swaths of Bromeliads and Heliconias. 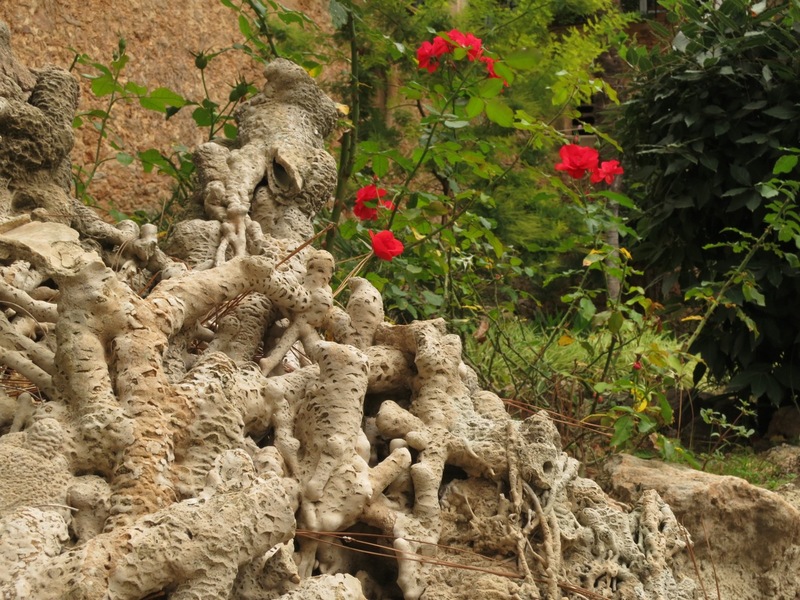 You might not be able to get blood from a stone, but it can sustain life! 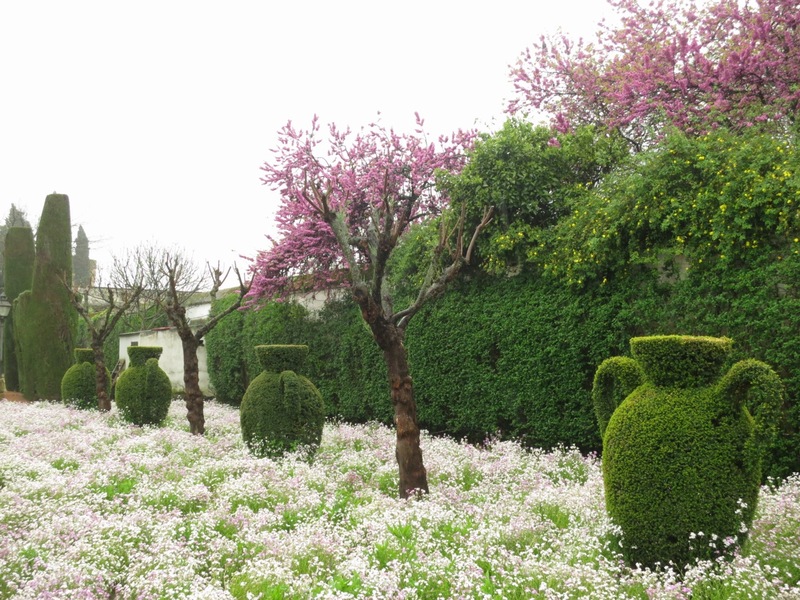 A repeating theme at the ‘sitio’ (farm), Mr. Marx liked to have ‘floating’ gardens in his water features. 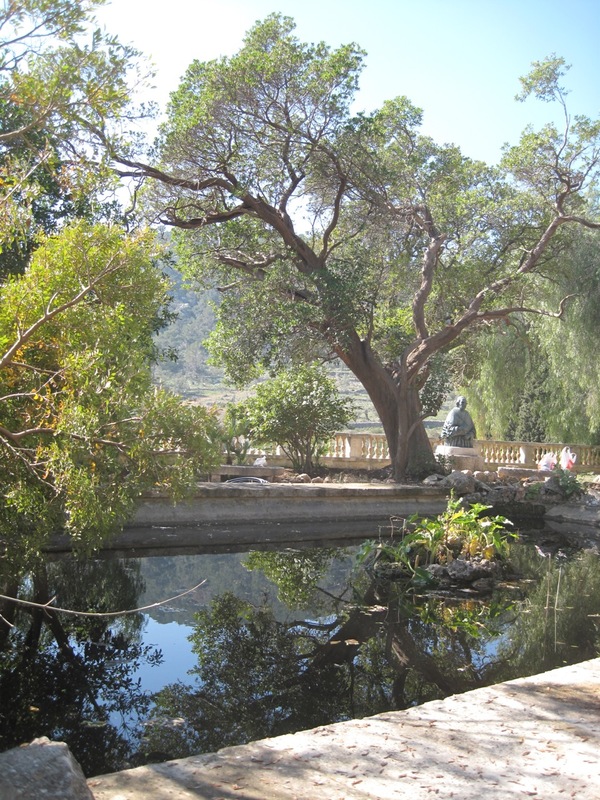 Some had pillars rising out of the water supporting planted containers, these ponds contain ‘islands’ of palm trees. I hope no one gets offended that I have wandered off the Gardens path. 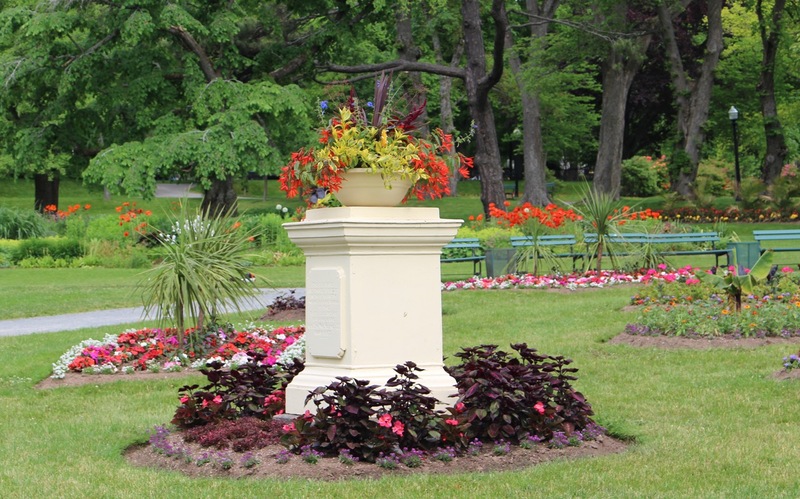 The Halifax Public Gardens hold a special place in my heart and I endeavor to keep it prominent in the conscience of Haligonians and all lovers of gardens. This garden also holds a special place in my Brazilian heart. I’m proud of the work that Mr. Marx devoted his life to and elated that he donated his ‘sitio’ to the Brazilian government so that it would be preserved for future generations. I salute all efforts to maintain and preserve these beautiful spaces so that we can continually be connected and inspired by the wonders of nature. Author SerenaPosted on February 20, 2012 Categories beyondthegardens, photo tourTags beyondthegardenspath, Burle Marx, Sitio Burle Marx2 Comments on Off the Gardens path we go….at least while our beloved Public Gardens are asleep.